Matt Landfield – Writer. Director. Dad. 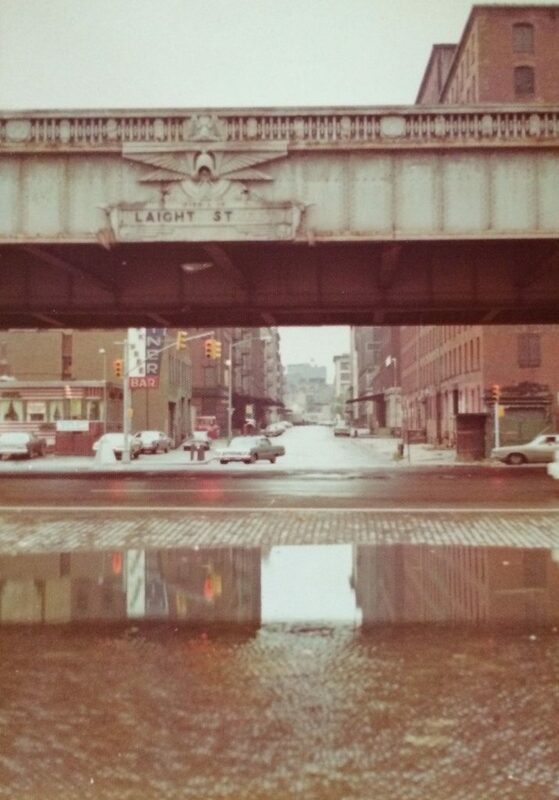 A reflection on growing up in TriBeCa through a post-Sandy lens. The roof lintel, arched windows and sculpted keystones of 31 Desbrosses Street. Photo courtesy of the Tribeca Trust. I pulled the car to a stop. I left the car running, my wife in the front seat. I stepped out on the cobblestone street, the cold wind from the river on my face. An Uber SUV sat idling to my left as I crossed Desbrosses street, the only other car with a person in it on the block. The sidewalk hadn’t changed. At the corner of Desbrosses and Washington streets, the grey paving squares were cracked and worn, with a second lip of concrete set back from the curb, a step up from the level of the street. Tiny threads of moss grew in the crevices, and a long rust-colored mark trailed along the inner edge of the step, where rain fell from the lintel of the roof, leaving residue of the copper and masonry that lined the building six stories above. The mark had barely changed in the thirty-odd years since my friend Sara, no older than 5 or six, pretended that walking over it would make you pee. The space where 31 Desbrosses Street stood. Photo by the author. But the building was gone. A green construction fence surrounded the site, with two or three diamond-shaped windows cut in the plywood. Peering through the plexiglass, I saw nothing but a pile of red bricks, patched with snow, filling the bare foundation. I snapped a picture or two, and took a deep breath. The building was gone. The foundation at 31 Desbrosses Street, March 2015. Photo by the author. The building was the home I grew up in, on the corner of Desbrosses and Washington Streets, in TriBeCa, lower Manhattan. My parents had lived there all of my life, until Hurricane Sandy pushed the Hudson River four blocks inland, covering the street in three feet of water. 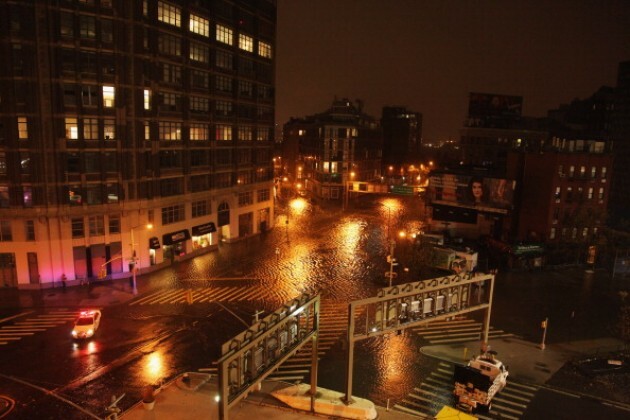 The intersection of Hudson Street, Canal Street, and Desbrosses Street (left), during Hurricane Sandy, the night of October 29th, 2012. The entrance to the Holland Tunnel is at the right. The waters receded, but the chaos left behind by the hurricane eventually culminated in the destruction of my childhood home. The building was gone, my parents were gone (alive, in good health — living elsewhere), and I was left peering through a construction fence at a place that now existed only in memory. 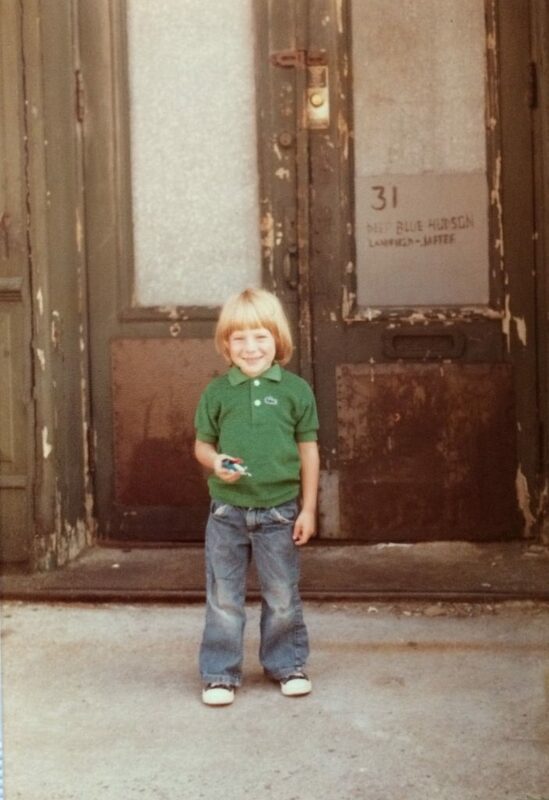 The author outside 31 Desbrosses Street, circa 1980. Photo collection Landfield family. First, a little bit about me. I was born in 1976, in a hospital called The French and PolyClinic on the west side of Manhattan. The only thing I ever knew about the hospital was that my mother told me it was closed, and that “it was in the theater district.” The French and Polyclinic hospital had been a conglomeration of the French Hospital on 30th street, and the Polyclinic Hospital on 50th street (in the theater district), which joined in 1969, and then went bankrupt and closed in 1977, nine months after I was born (the building still stands on west 50th street near 8th avenue). The Polyclinic Hospital on west 50th Street, 1915. 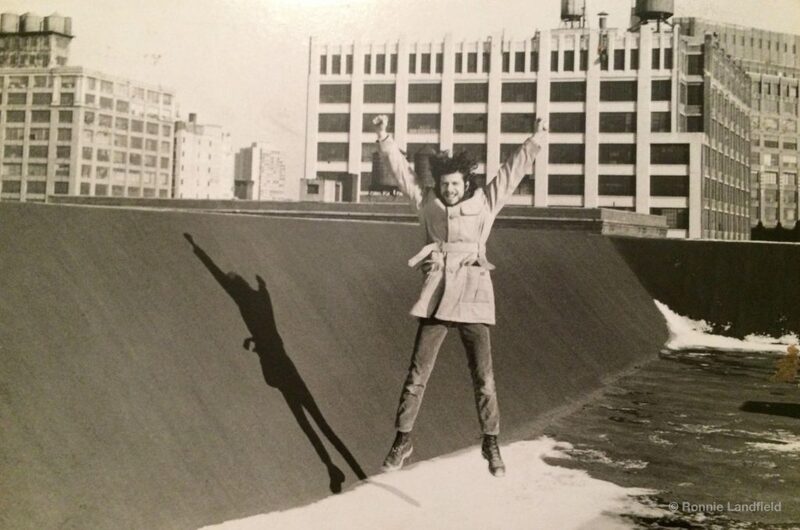 My father, Ronnie Landfield, on the roof of 31 Desbrosses Street, winter 1969–70. Photo by Melissa Schook. My parents were artists. 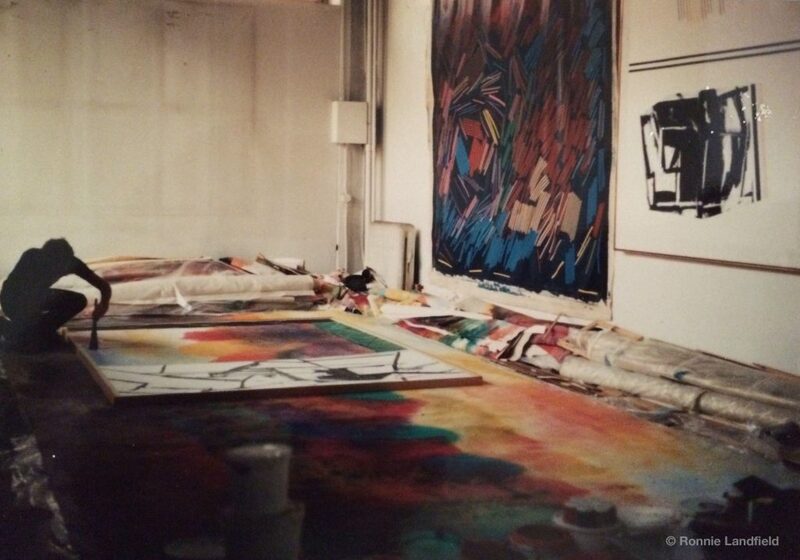 My father, Ronnie, an abstract painter, had been born and raised in the Bronx, and my mother Jenny, had been born in Manhattan and raised in the East Village and Forest Hills, Queens. They had both been on their own from the age of 16, and like other artists in the 1960s, lived a bohemian life. Seeking space to paint and live, they found their way to 31 Desbrosses street in 1969, after living in a loft at 94 Bowery. Along with two fellow artists from the David Whitney Gallery — Ken Showell and Bill Pettet — they rented the six-story former Pertussin cough-syrup factory and divided the building between the three artists, each taking two floors. 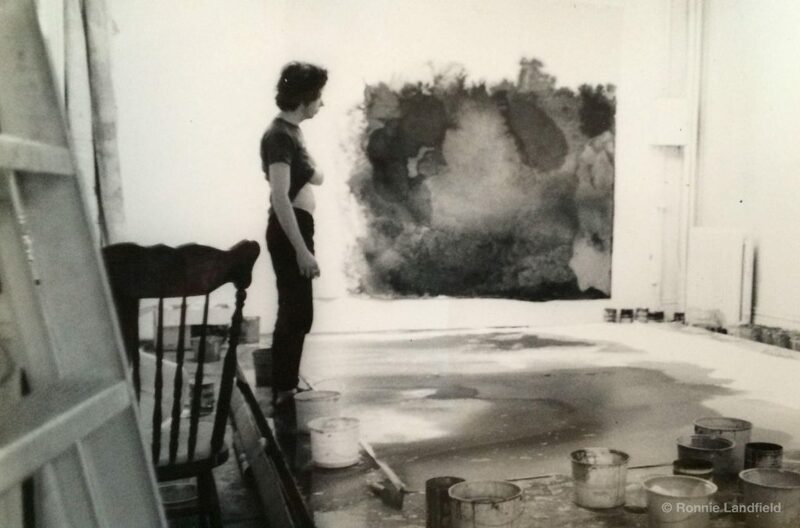 My mother Jenny Landfield, 1970. Photo collection Landfield family. My father and mother took the first and second floor. As a child, I knew no other home until I left for college in 1994, at age 18. My father Ronnie, in the studio at 31 Desbrosses Street, 1970. Photo collection Landfield family. Standing there, looking through the hole in the fence, I looked down into the history of the city, an invisible road map of the past. A mirror in which I saw a vision of myself, the chrysalis of a place that could now only be seen with the mind. Staring at the naked foundation, scraped and bare, loaded with crumbled brick, timber and dirt, my mind lifted the stones and the glass, the beams and timbers, the plaster, the tin, and the earth, and reconstructed the place of my birth, the home I lived in but perhaps never knew. I peered through the window and saw the place where my father sat, the table where he made paintings, his desk and his chair. Ronnie in the studio, 1989. Photo collection Landfield family. I saw the staircase, the doors, the floors and the ceiling, the weight of the majestic structure as it sat on the corner of the block like a tall ship against the sky. I saw the history of my life before me, invisible but floating there in the empty space, so close, so solid, so permanent, and yet completely gone forever. My brother Noah and I on Desbrosses Street, 1984. Photo collection Landfield family. 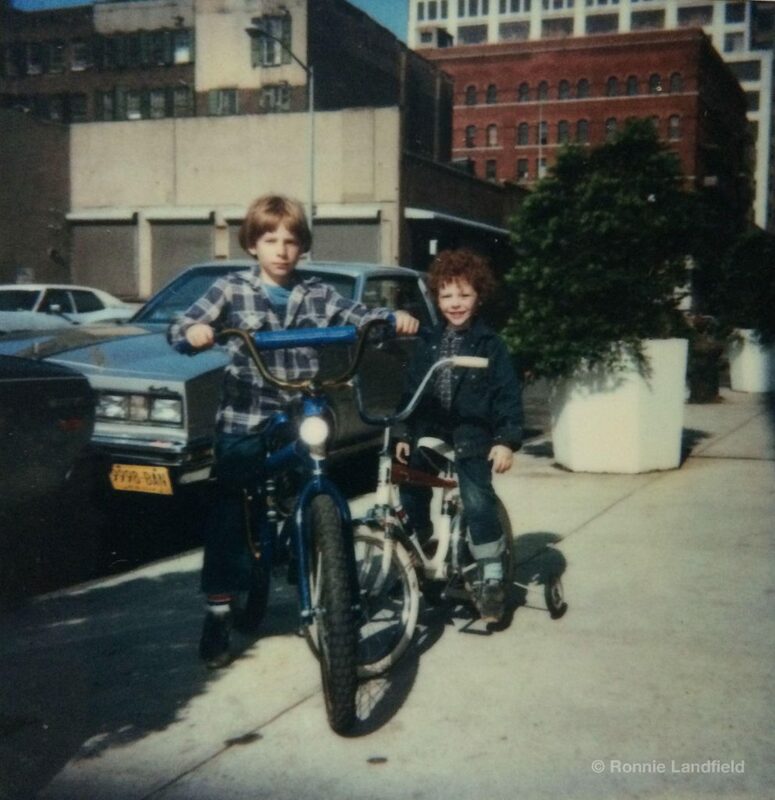 I thought about all the years of growing up, the quiet Saturdays when the neighborhood was even emptier than usual, and my brother and I would ride our bikes on the deserted streets. I saw the room that my brother and I shared, and I remembered my first moments with him, and the shock of suddenly having to share my comfortable world with someone new. 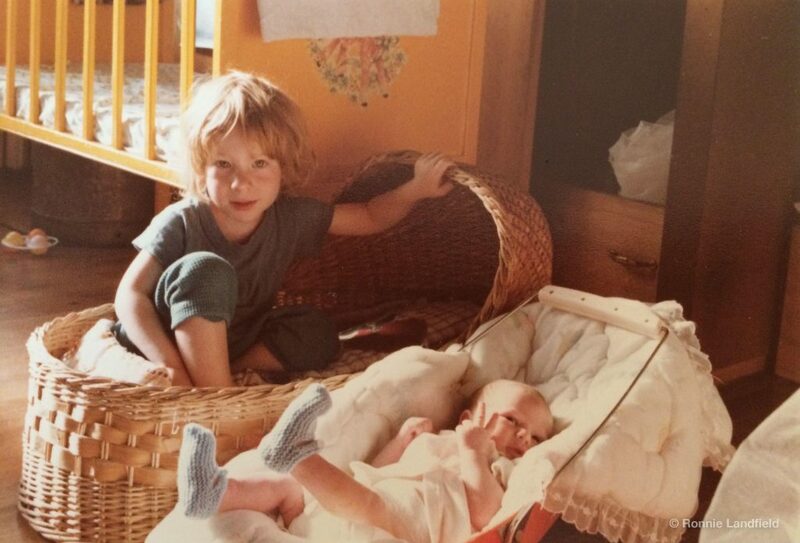 My brother and I, June 1979. Photo collection Landfield family. In wiping the building away, something new emerged: an awareness that there was a “before.” Looking down into the foundation and the surface of the ground it occurred to me, maybe for the first time, that something else had been there before this building, before we were there, and suddenly I wanted to know what it was. I suddenly craved a connection not simply to the place that was lost, but to the land that remained. The physical presence of the building had dominated my experience and my memory, and was seared into my psyche at the level of myth; a place so familiar it extends intact into my dreams. Yet the illusion of permanence had blinded me to something else — the place itself was more than the architecture built on it; it was a part of nature, and maybe had a place in a greater drama than I was aware. Suddenly, I wanted to know, what was this place? The story of this building, this place, is the story of a new city emerging from the mantle of an old one. But the story of this building is also my story, the story of my family, and a coming of age story for the city and for me. The story is also about TriBeCa. What it was, how it started, what it is now. And where it’s going. The land that we now call TriBeCa (the Triangle Below Canal, though it’s really a trapezoid) sits on the western edge of the southern shoulder of lower Manhattan, and is formed by the boundaries of Canal Street to the North, Broadway to the east, and Vesey Street to the south (at one time, Chambers Street). 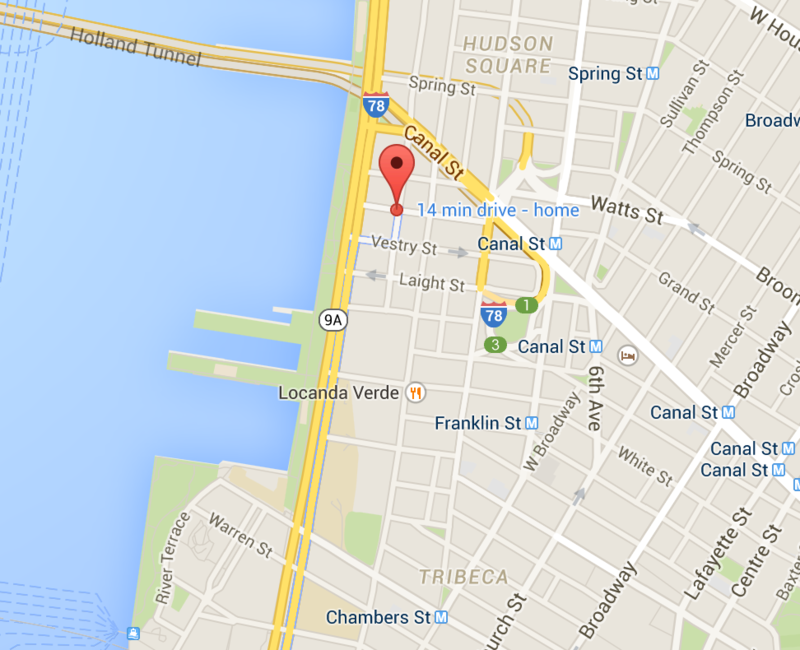 And my home at 31 Desbrosses Street was right at the north western tip, two blocks below Canal Street at the corner of Washington and Desbrosses, one block from the Hudson River. 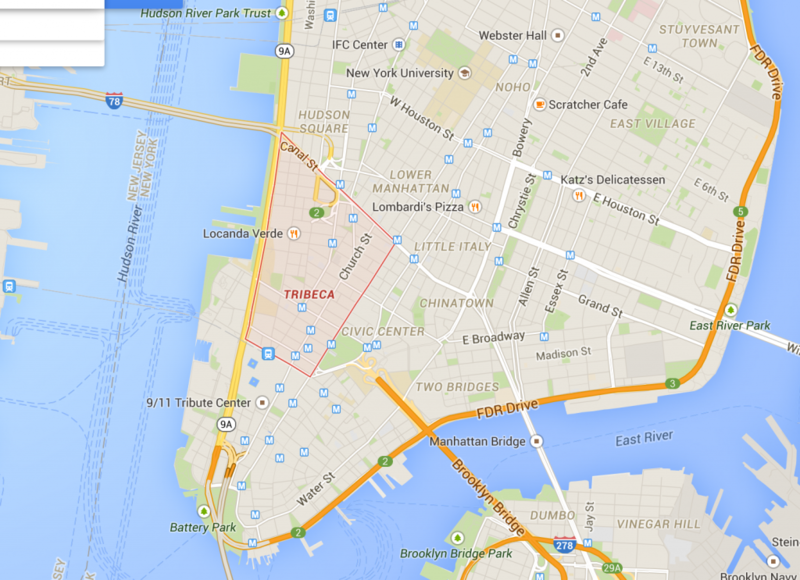 But how did TriBeCa become Tribeca? Who was Desbrosses? And how did we get there in the first place? To understand that, I had to take a step back and look at a little bit of history. 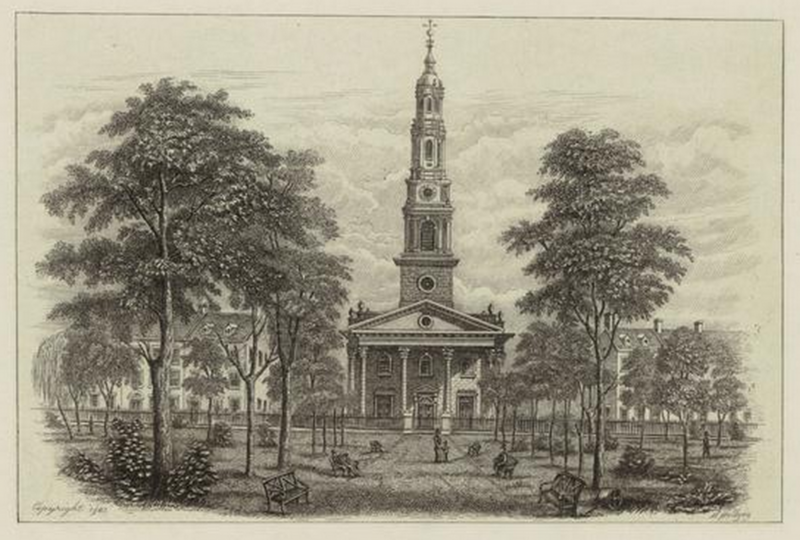 By the middle of the 17th century, the English had seized it from the Dutch, and in 1705, a tract of land stretching from Chambers street to Christopher street (much of what is now TriBeCa, parts of SoHo, and the West Village) was granted to Trinity Church by Queen Anne. This tract of land came to be known as the Trinity Church Farm (Trinity Church still owns much of the land between Canal and Christopher Street, and is one of the city’s largest landholders to this day). 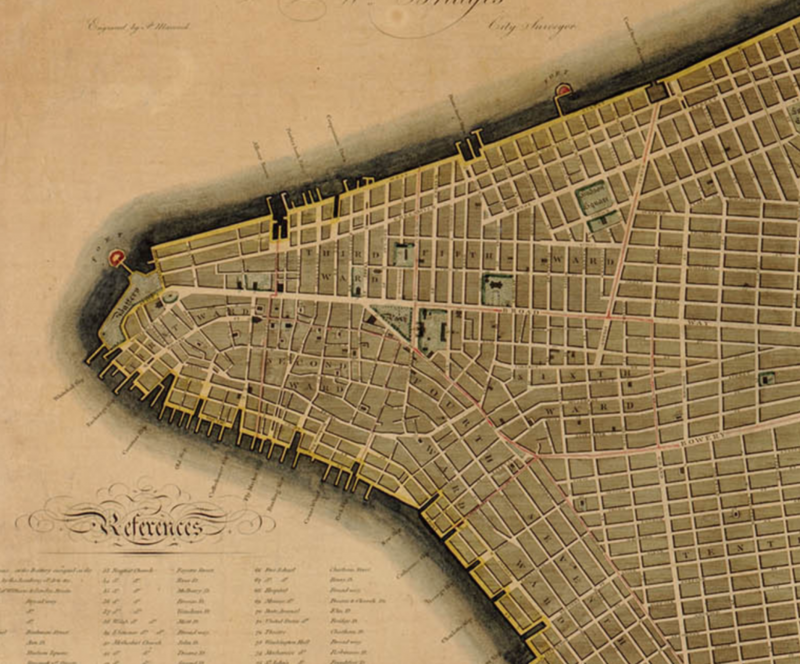 In the 18th century, the western shoreline of the island was irregular, and ran along what is now Greenwich street. Between 1798 and 1828 landfill of sand, oyster shells, sunken ships, and other bulk was used to expand the island westward, pushing into the deeper waters of the river and forming a long, straight shoreline with docks and piers to facilitate shipping. Washington street was extended from the south, and West street was created along the waterfront. A map of the city from 1798. 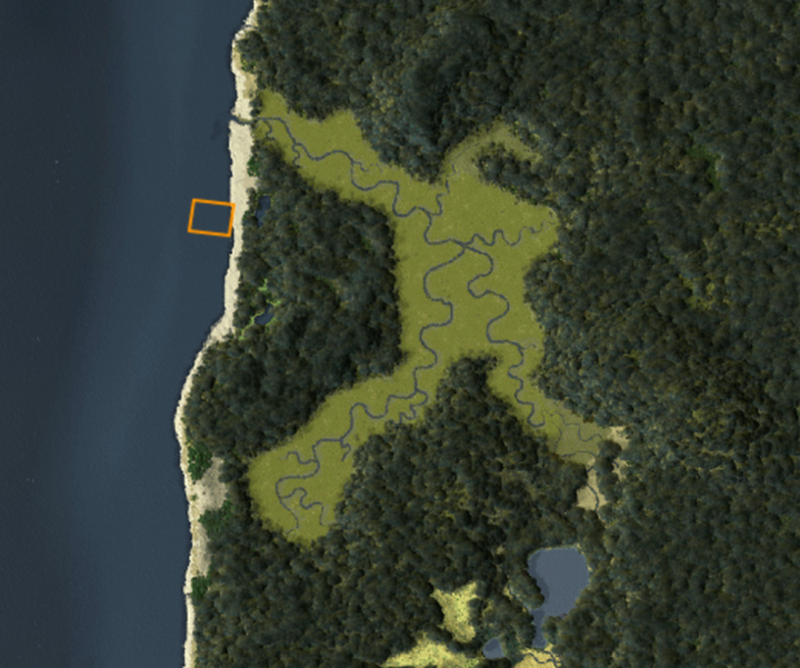 The irregular shoreline along the Hudson river extends north from the Battery. Collection of the NYPL. The plan of the city from the 1811 William Bridges Map. The extended, straightened shoreline along the Hudson includes the extension of Washington Street and the creation of West Street along the water front. Collection of the NYPL. 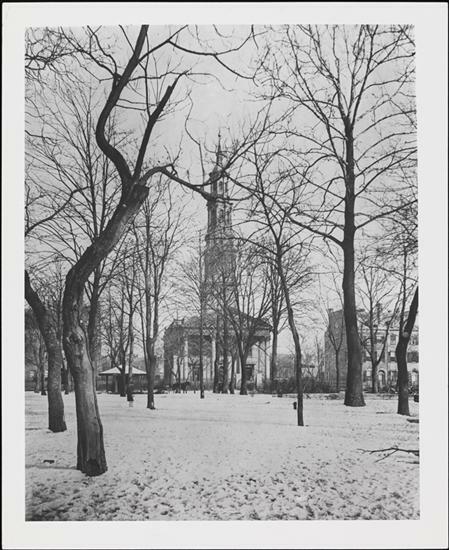 As the area was developed it was divided into blocks and lots, and many of the streets were named for prominent vestrymen of Trinity Church, including Chambers, Reade, Duane, Harrison, Jay, Moore, Laight, Desbrosses, Watts, Clarkson, Vandam, King, Morton, and others. 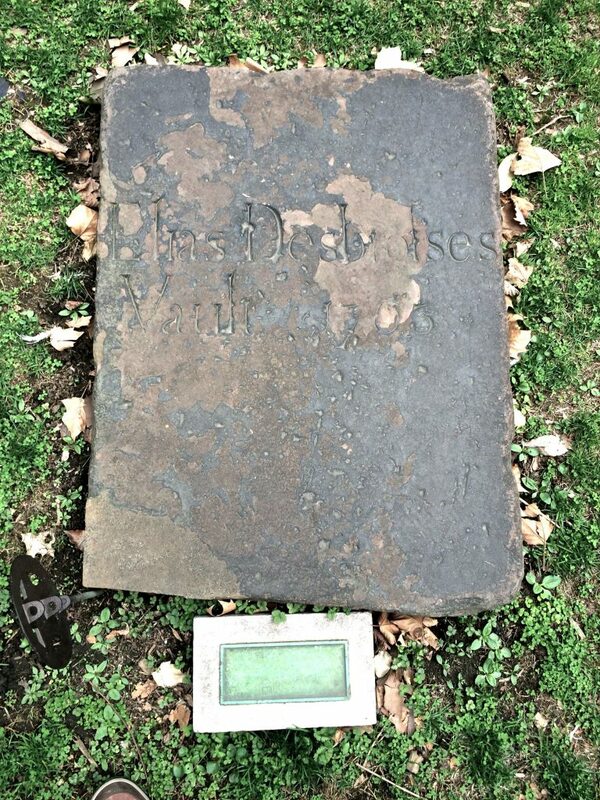 Desbrosses street itself was named for Elias Desbrosses, a prominent merchant from a French Huguenot family (French Protestants), founder of the New York Chamber of Commerce, and vestryman of Trinity Church who died in 1778 and was buried in the cemetery in the Trinity Churchyard. Elias Desbrosses’ gravestone in the Trinity Church Cemetery. Photo by the author. Elias Desbrosses was also a warden of the church, and a prominent and venerated member of the congregation, known for his charitable giving. But Elias Desbrosses never lived on Desbrosses Street. 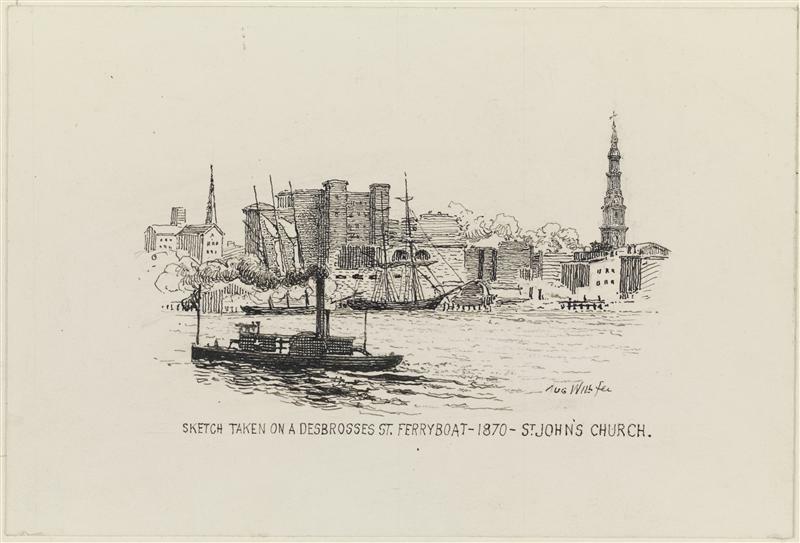 The Desbrosses family were merchants involved in the shipping trade, and during their time of the 18th century, virtually all of that business was conducted on the waterfront of the South Street Seaport on the East river. 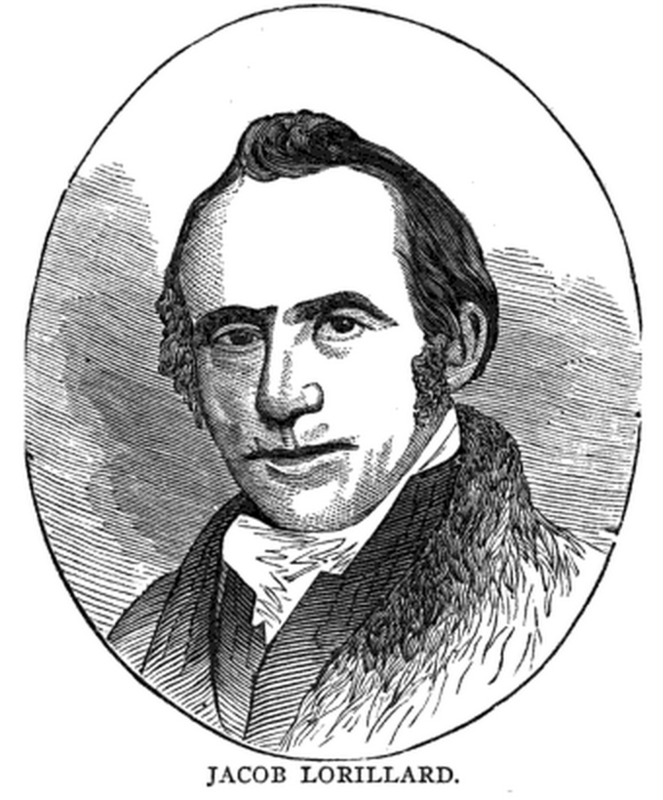 Other than Elias Desbrosses’ affiliation with Trinity Church, his connection with the street that bears his name is virtually nil. So if Elias Desbrosses didn’t live on Desbrosses Street, then who did? The answer is Leonard Lispenard. The house of Leonard Lispenard in Lispenard Meadows, near the present day Canal Street. This view faces west with the Hudson in the background, Circa 1785. Collection NYPL. Leonard Lispenard was a landowner, merchant, brewer and politician who lived in New York in the late 18th century. In addition to being involved in the politics of the city, Leonard Lispenard was an active revolutionary and militiaman. 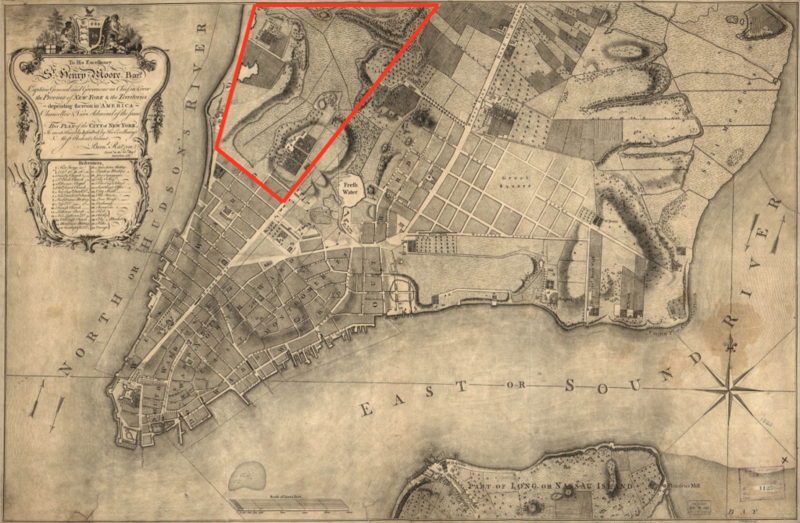 And, he also happened to possess a large tract of land on the west side of Manhattan, north of the settled part of the city (north of Chambers street during that time), where he had a large house and quite a few acres of farmland surrounded by swamp. 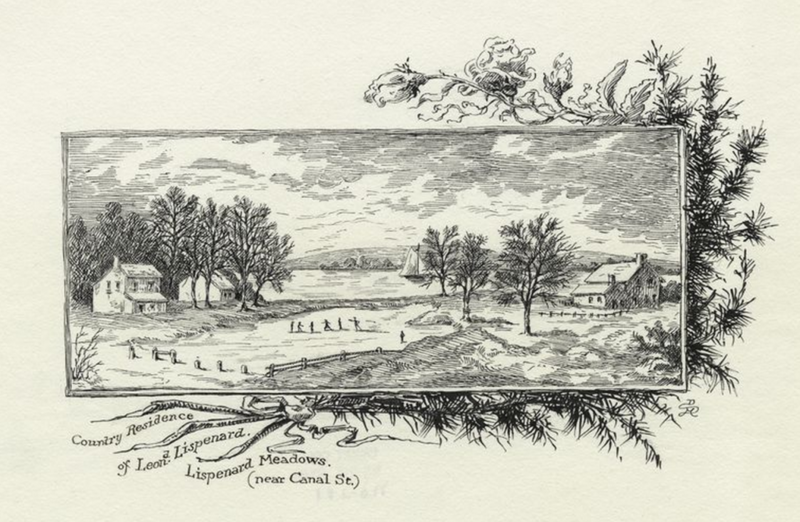 He had leased 83 acres of swampy land from Trinity Church in the 1750s (a subsection of the Trinity Church Farm) with a mandate to drain the swamp and cultivate the land, and this part came to be known as Lispenard Meadows or Lispenard Swamp. Much of this land is now what we know of as TriBeCa. 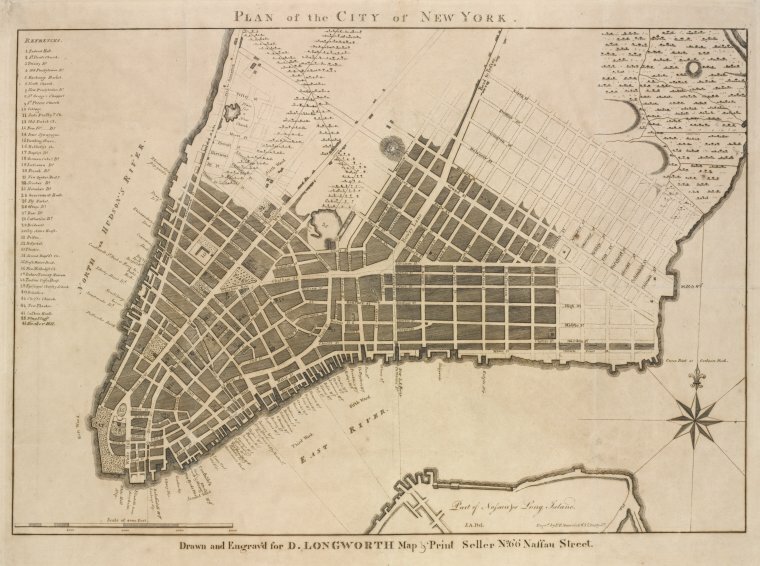 Map of lower Manhattan, 1767. Leonard Lispenard’s farmland is highlighted. Collection NYPL. 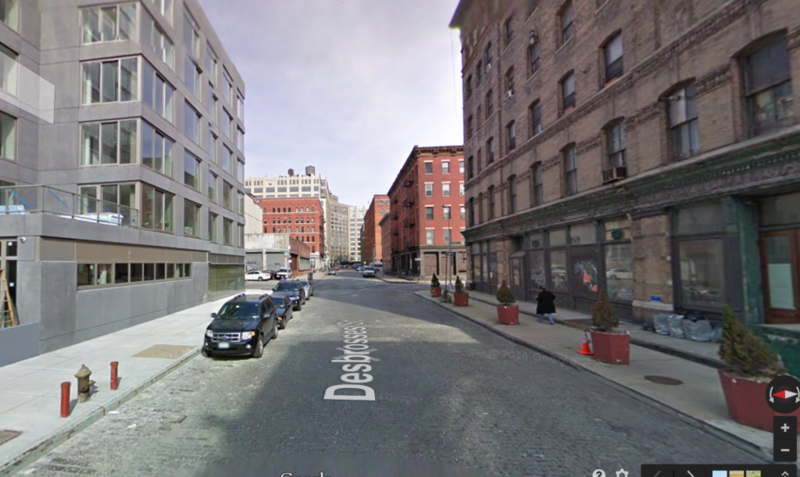 Detail: Leonard Lispenard’s homestead on the right, along the “road to Greenwich” (now Greenwich street). Chambers street is the last unmarked street on the center left. (Map rotated for readability). Embarking from Hoboken, Washington crossed the Hudson and landed near what is now Laight and Greenwich Streets. He and his men made their way to Lispenard’s house where they spent the night, thus bypassing the city proper, and the British army. 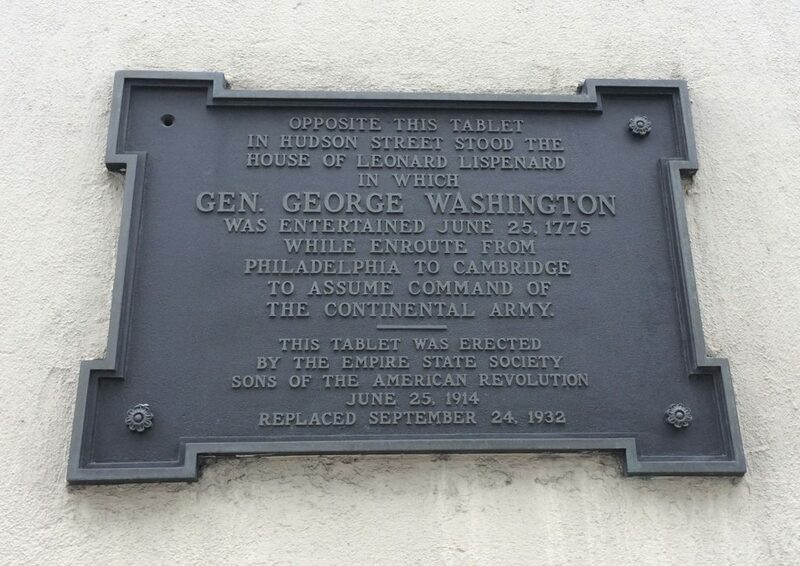 A plaque at the intersection of Desbrosses and Hudson Streets marks the place where Leonard Lispenard’s house once stood. So Leonard Lispenard lived at Desbrosses Street, as early as the 1740s. But that’s still not the whole story. The Lispenard house was located along Hudson Street, on the east side of Greenwich street — on land that was part of the natural shoreline. West of Greenwich street during Lispenard’s time wasn’t land; it was water. The two blocks west of Greenwich weren’t land-filled until at least 1798, and probably not until after 1803 when maps clearly show the layout of the new streets. So, who lived on the block between Washington and West, along Desbrosses Street? Finding specific answers about places in New York City that are not the sites of major landmarks, or the homes of prominent personages is maddeningly difficult, but being the curious “lay historian” that I am, I turned to every researcher’s secret (and not so secret) superpower: Google. Through Google I found an incredible wealth of documents, books and photographs in the public domain that helped me track the history of the building’s ownership back to around 1911, when a prominent Broadway playwright named Theodore Burt Sayre bought the building as an investment property. But before that the trail went cold. Who built the building? Who owned the land before the building was built? What was there before? These were all questions that I wanted to know, and so off I went to the New York City Department of Records. The Department of Records is one of those city agencies that you imagine being something like Gringott’s bank from Harry Potter: a dark, cavernous vault filled with dusty tomes and gnome-like creatures who size you up as though deciding whether to answer your questions or eat you for dinner. And you would not be far off, except for the part about it being dark. Situated on the 13th floor of a building that shares offices with the parole board and a number of other city agencies, the department of records consists of a few desks with some old, out of date computers, a few micro-film review stations, and rows and rows of shelves loaded down with dusty tomes, containing the property records of virtually every city block and plot of land dating all the way back to the 1700s. It was here that I found “The Book of Conveyances” (books, really) that contained the history of the block at Desbrosses and Washington streets, and peeled back the veil of history to peer into the forgotten past of lower Manhattan. There I found a succession of unfamiliar names, listed in the “Index of Conveyances” (a register of property records) that illuminated New York’s Colonial and post-Colonial past, and the growth of the city into a commercial and financial empire. The first of these was a man named Hugh Gaine, who was the first individual owner of the land after purchasing it and several other parcels of waterfront land from Trinity Church in 1803. 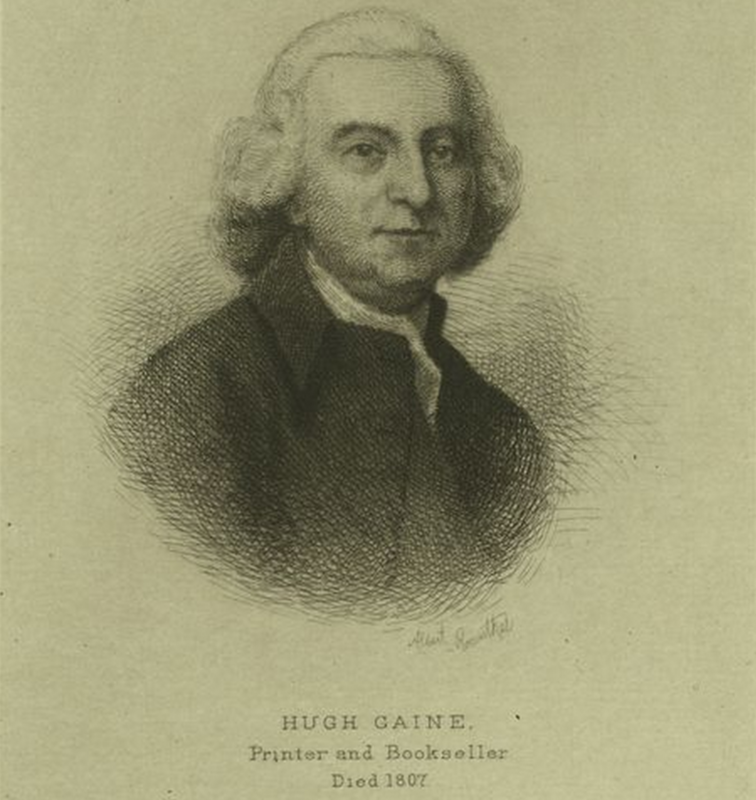 Hugh Gaine was a prominent publisher during the revolutionary war period (who went back and forth in his loyalties depending on who was in power), and was (like Elias Desbrosses) a Vestryman of Trinity Church between 1792 and 1807. He was also, as it turns out, a bit of a land speculator (and likely a neighbor of Leonard Lispenard). By 1803 Gaine had acquired the entire riverfront block between Desbrosses and Vestry Streets as well as the block north of it, and by 1804 he had the lucrative water rights that went along with them. During this period the city encouraged property owners to develop the waterfront on their own dime, in return for valuable wharfage rights, and Hugh Gaine was nothing if not a savvy businessman and certainly took advantage of the opportunity. 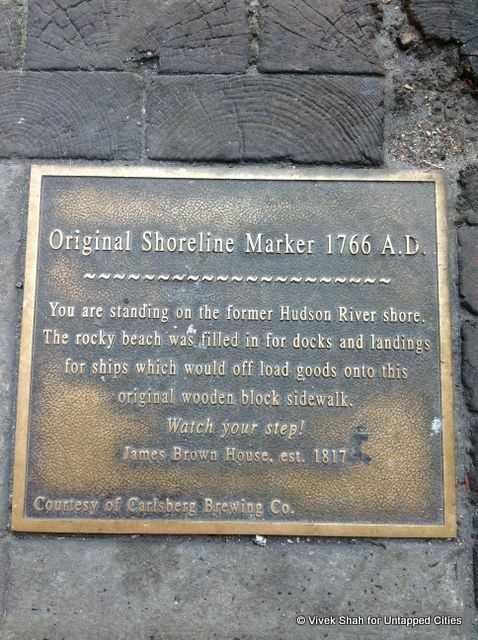 Though Hugh Gaine dies in 1807, it’s likely that his heirs, with the aid of a dock builder named Jacob Halsey, began to fill in the land and develop the blocks west of Greenwich street into valuable waterfront property, and by 1824, this task was completed. After the Erie Canal opened in 1825, the Hudson River wharf, with its deep-water berths and proximity to the Washington Market, became a lynchpin of trade between the Port of New York and the interior of the continent, enabling the city to become the largest and most important port of trade in the world. Years after Hugh Gaine’s death, his heirs sell off his holdings, and an 1824 auction notice from his estate lists the block between Desbrosses and Vestry streets, west of Washington Street, as one of the lots for sale. The man who buys the land from Hugh Gaine’s estate is Jacob Lorillard, of the Lorillard family, a prominent family in New York society in the 19th century. While the Lorillard family is known for founding the Lorillard Tobacco Company (later the American Tobacco Company), Jacob Lorillard was a leather tanner, banker, philanthropist and major land speculator (he bought more than 100 lots of property all over lower Manhattan), and he too was a Vestryman of Trinity Church, serving from 1826–1838. Hudson Street, at the corner of Vestry, opposite the former site of St. John’s Park, 1900. Jacob Lorillard likely owned a house much like the federal style houses that can still be seen in the background. The Hudson rail line can be seen in the foreground. Collection NYPL. 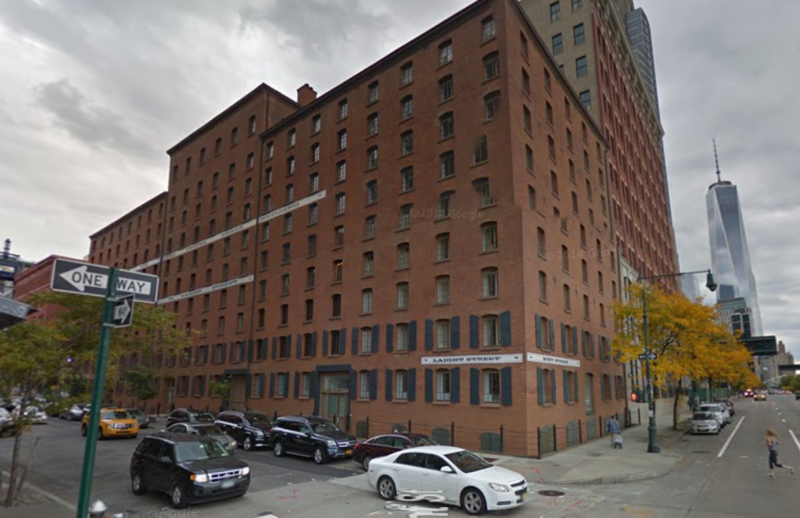 Jacob Lorillard had a house in the Fifth Ward (the area we now call TriBeCa) known as the Lorillard Homestead, at the corner of Laight and Hudson Streets, opposite St. John’s Park (or Hudson Square, now the exit plaza for the Holland Tunnel). In 1846, after Jacob Lorillard’s wife Margaretta passes away (Lorillard himself dies in 1838), their holdings are divided between their son and five daughters (and their husbands, as women were only just beginning to be allowed to legally own property). 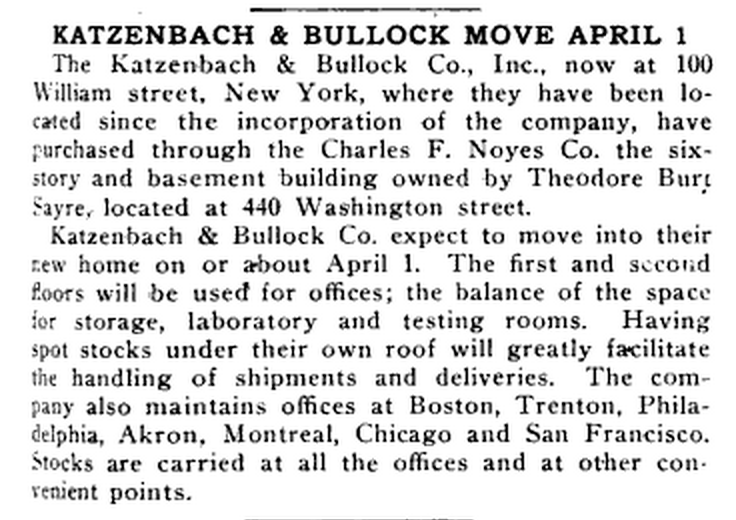 Lorillard’s eldest daughter, Catherine Anna, married to a prominent doctor named George Phillip Cammann (one of the inventors of the binaural stethoscope), retains ownership of the part of the block on which 31 Desbrosses Street would later be built. Catherine and George P Cammann live in the neighborhood at the Lorillard Homestead until the 1850s when they move uptown, but the land on Desbrosses Street remains in their hands and in the hands of the trustees of the Lorillard estate until the 1890s. St. John’s Chapel, 1829. Collection NYPL. St. John’s Park, circa 1867. Image courtesy the Tribeca Trust. 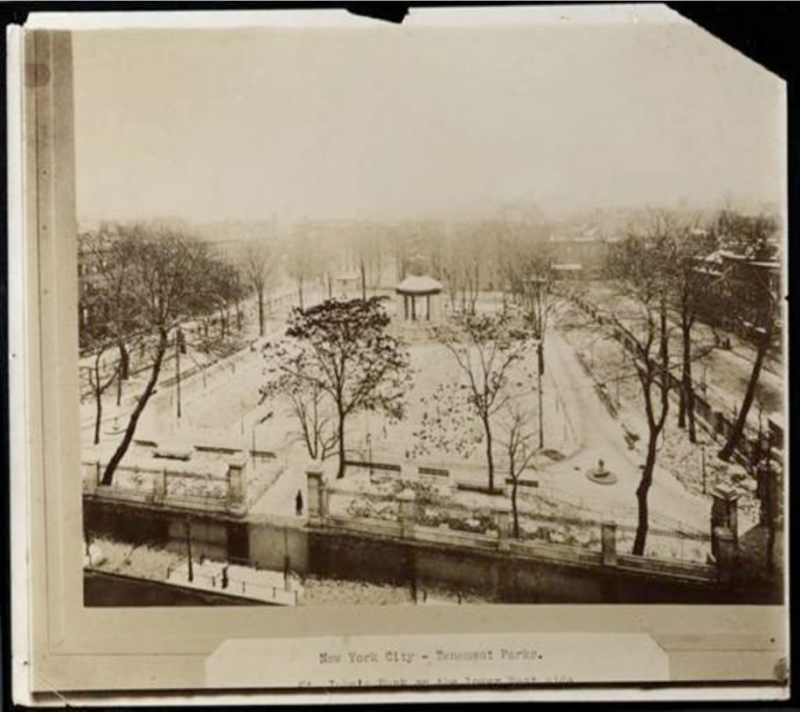 St. John’s Park, and the chapel for which it was named, was built by Trinity Church in 1803, and was the model on which later parks like Washington Square and Gramercy Park were built. The park became the anchor of a fashionable neighborhood which grew around it between 1820 and 1850. 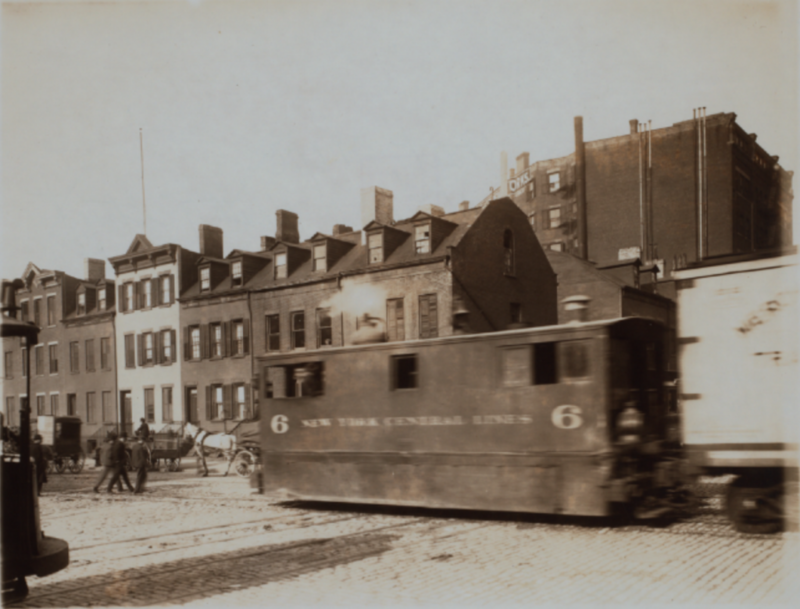 After 1851, railroad tracks were laid along Hudson Street and the growth of industry prompted the flight of the elite further uptown. The chapel itself was torn down in 1918. West Street looking north from Cortlandt Street, 1900. Now the site of Battery Park City. Collection NYPL. This time period is one of tremendous economic growth in lower Manhattan, including the expansion of the port from the East River, north along the Hudson (also called the North River). 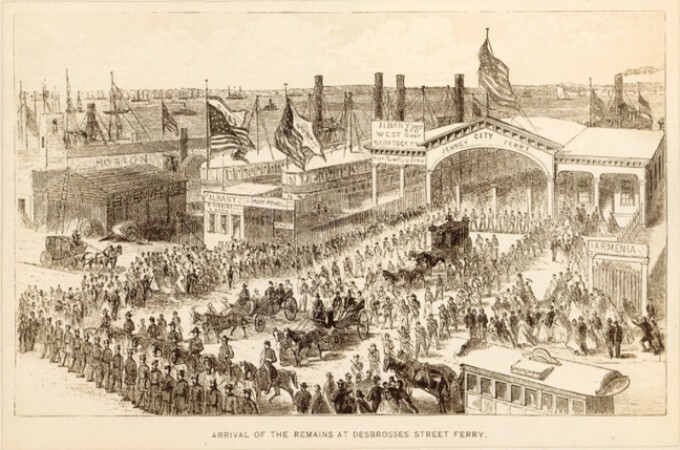 In 1862 the Desbrosses Street Ferry opens, and regular crossing to Jersey City becomes routine. The Pennsylvania Railroad opens a terminal at Desbrosses Street, to ferry goods and people back and forth from Manhattan to New Jersey at high volume. Sketch of the West Side Piers Circa 1870, drawn from a Desbrosses Street Ferry. Collection NYPL. Lincoln’s hearse arriving at the Desbrosses Street ferry, in the funeral procession to City Hall, 1865. After the opening of the Erie Canal in 1825, and the development of newer and larger ships that required deep-water berths, the Hudson River piers formed the foundation of New York’s rise to become the foremost capital of global trade in the world. With a large natural harbor and a water-link to Lake Erie — and by extension, the interior of the North American Continent — New York City becomes the nexus of major industry and trade connecting American goods, capital and resources to the rest of the continental US and the world. And it is in this environment that the first tenants of 31 Desbrosses Street appear. Perris’s Insurance Map, 1853. A small brick structure (tiny pink square) possibly a shed, is marked on the south-west corner of Desbrosses and Washington, beside a coal and Mahogany storage yard. Collection NYPL. An advertisement for J. Copcutt Mahogany at 440 Washington Street, from 1891. 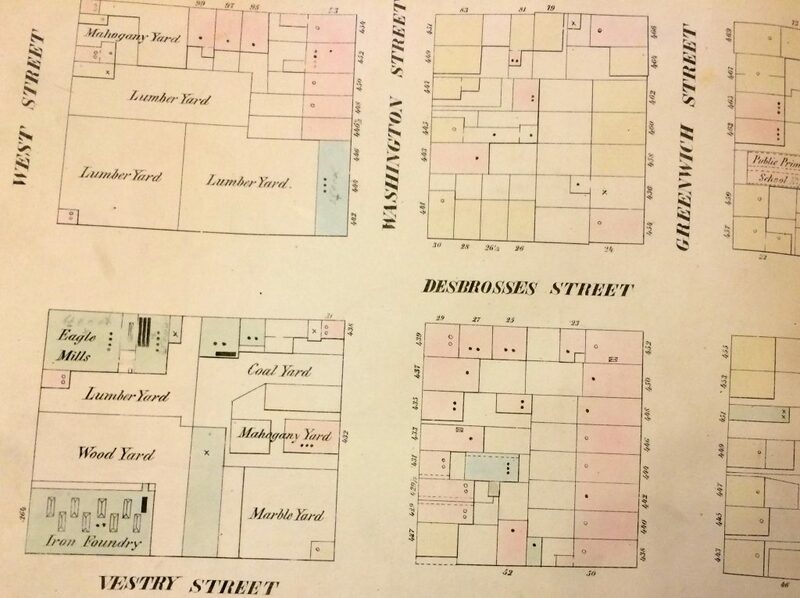 According to William Perris’s insurance maps of Manhattan, by 1853 (and probably before) the corner at Desbrosses and Washington Street was occupied on both sides by storage yards, and the one at 31 Desbrosses street contained coal, and later, mahogany. This lumberyard was owned and operated by two brothers, John and Francis Copcutt as early as 1835, who according to a City directory were “importers & general dealers in mahogany, rose, satin, zebra, holly, maple, oak, walnut, & other foreign & domestic woods.” The Copcutt brothers travelled far and wide, and received shipments of wood from all around the world at their storage yard on Washington and Desbrosses Street, and then sent lumber up the river to Yonkers for milling and cutting. The two brothers remain in business together until 1875 when they have a falling out and one decides to retire, but the mahogany yard remains at 440 Washington until the 1890s. Francis Copcutt, re-enacting his climb of Mont Blanc, in 1868. Copcutt looks like he would have been right at home with the avant-garde of the 1960s. 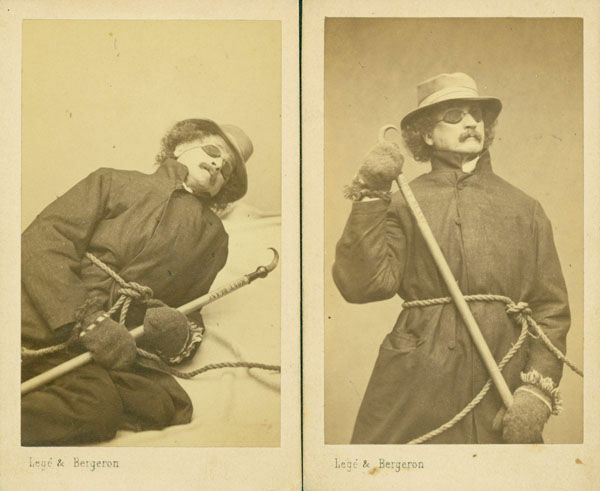 Photo credit: Legé & Bergeron. 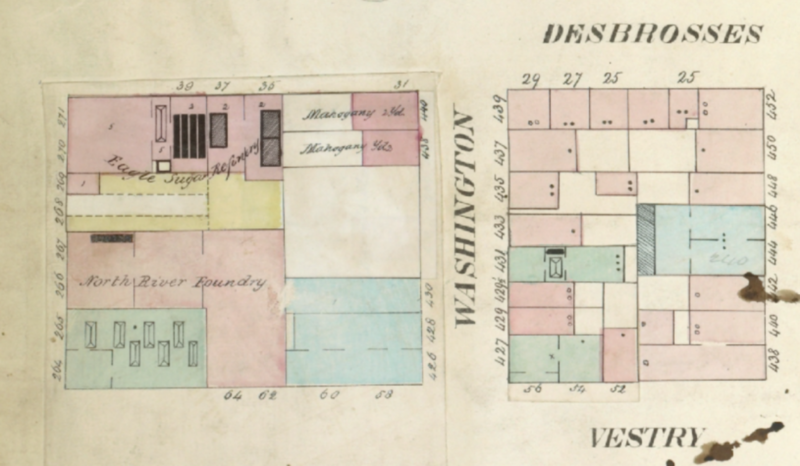 On this detail from Perris’s insurance map of 1857–62, the Mahogany lots have moved to 438 & 440 Washington/31 Desbrosses Street. The Eagle Sugar Refinery and North River Iron Foundry also identify this block as an active manufacturing and industrial area of the waterfront. Collection NYPL. St. John’s Chapel on Varick Street, on the east side of St. John’s Park. Collection NYPL. 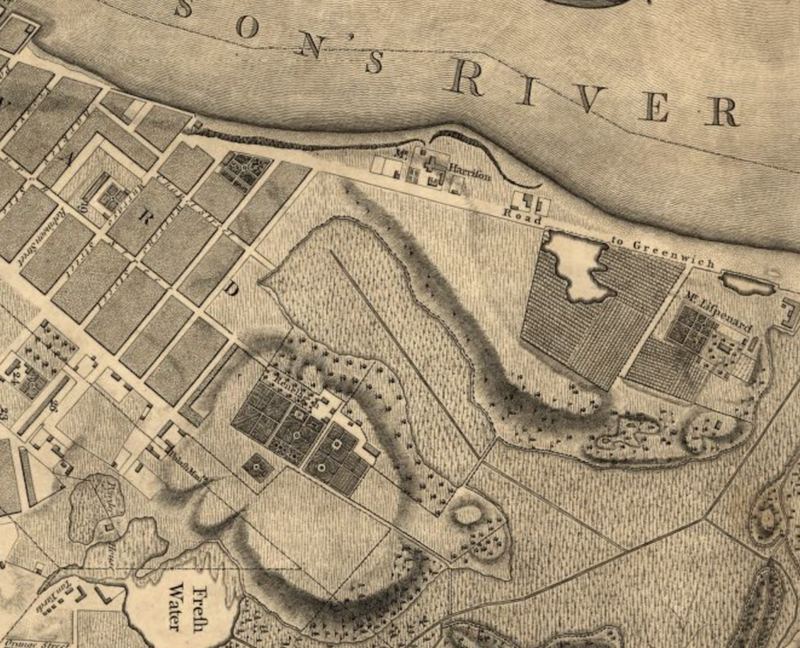 While parts of the Fifth Ward like St. John’s Park were fashionable from the 1820s to around 1850, once rail-lines were introduced to the area, most of the district was taken over by warehouses and manufacturing buildings for the busy waterfront along the Hudson River. Driven by technical advances like the coal-powered steam engine, and later the railroad, the neighborhood lost favor with elites by 1867, when a major rail depot was constructed at St. John’s Park. 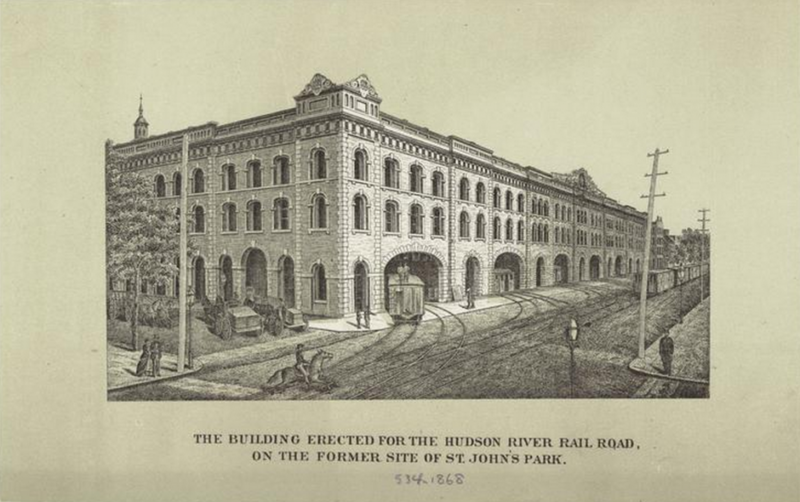 The Hudson River Railroad depot built on the site of St. John’s Park, circa 1867. Collection NYPL. The Fifth Ward, looking west from Hudson Street. Circa 1870. Photo by Nathaniel Fish Moore. 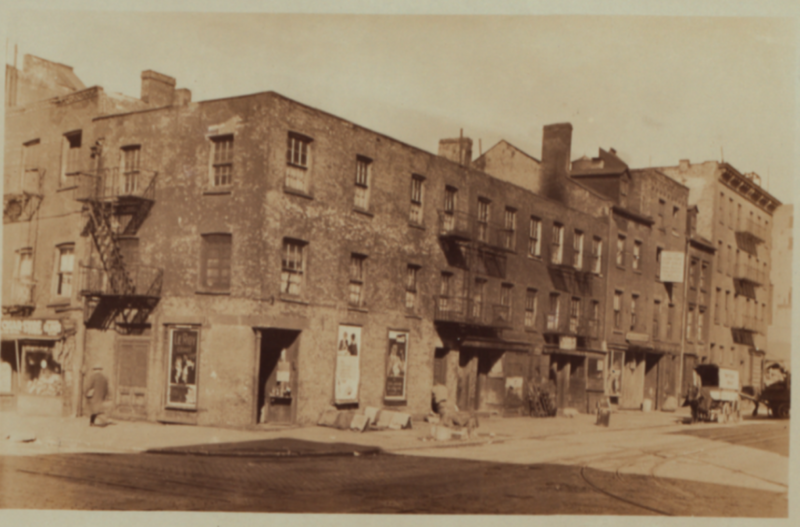 Tenement and federal style houses on Washington Street (likely built in the 1860s), north corner of Desbrosses Street, circa 1930. This entire block was demolished in 1940. Collection NYPL. The Fifth Ward also constituted housing for middle and working class residents (predominantly Irish and German immigrants of the first and second generation), though as the 19th century progressed, the commercial nature of the area increased and available housing dwindled. In the 1880s and 1890s through the 1910s, the city experienced an economic boom. During this time the majority of the remaining industrial warehouse buildings that characterize the neighborhood today were built, serving the vibrant commercial center of the Washington Market and the bustling docks along the Hudson River. The West Street waterfront, 1899. The Pennsylvania Railroad Freight Station along the wharf is at the left (now demolished), and the Grocers Steam Sugar Warehouse at the corner of West and Laight Streets is at the far right. Built in 1853, the Sugar warehouse still stands. Collection NYPL. 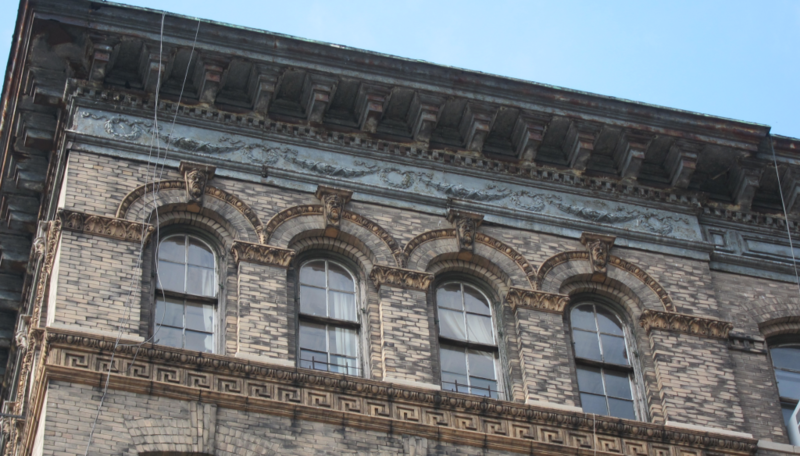 Through the mid-to-late 19th century the property at 31 Desbrosses Street (or 440 Washington Street) changed hands several times, until around 1898, the property comes into the hands of Henry and Hyman Sonn, also known as the Sonn Brothers. The Sonn brothers were Whiskey wholesalers, and in 1899 the “six-story with basement” industrial building at 440 Washington Street is constructed, and becomes their base of operations (the building is technically owned and built by a man named Sylvester L Mitchell and designed by the architecture firm of Kurzer and Rohl, but Mitchell appears to default on the mortgage, and the building is then acquired at auction for $50,000 by the Sonns). 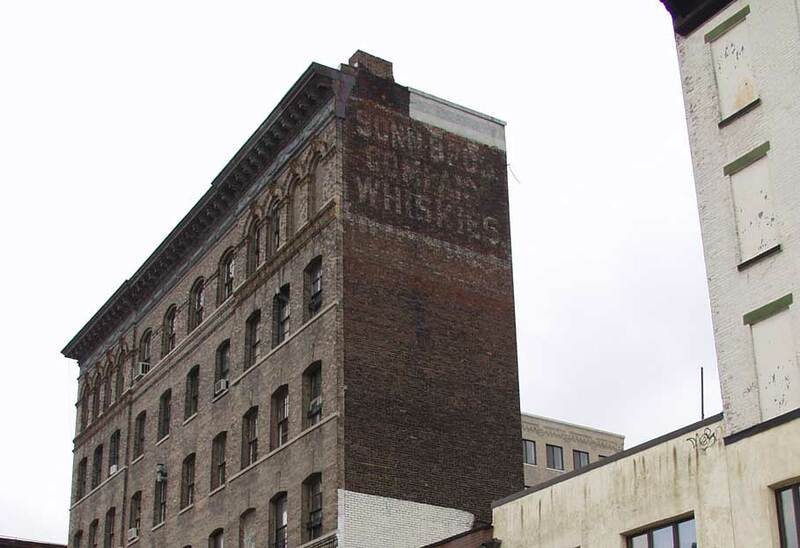 The building at 31 Desbrosses Street/44o Washington, with a faded billboard for “Sonn Bros. Company Whiskies” on the western facade. Photo courtesy Walter Grutchfield. After the Sonns, the building is acquired by a man named Theodore Burt Sayre. Sayre, a successful Broadway playwright and the son of a pharmacist (and, interestingly, also a playwright), purchases the building in 1911 and leases it for ten years to the Hoffman La Roche Chemical Works, a pharmaceutical manufacturer. In documents prior to 1966, the building is identified as being located at 440 Washington Street, the street number on it’s Eastern facade. 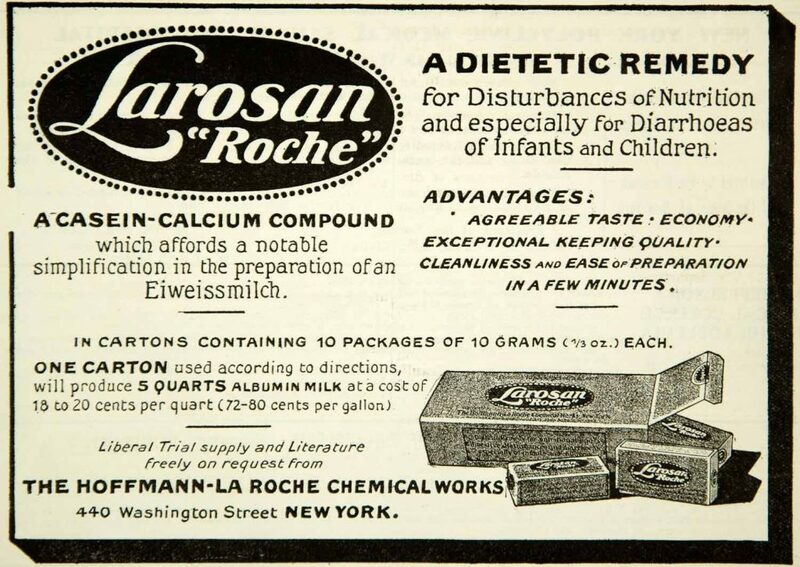 An advertisement for a dietary supplement produced by the Hoffman-La Roche Chemical Works, located at 440 Washington Street, circa 1914. In 1920 Sayre sells it to the Katzenbach & Bullock Co., also a chemical manufacturer. Still later in 1923, the building finds its way into the hands of the Seeck & Kade company, manufacturers of Pertussin Cough Syrup. 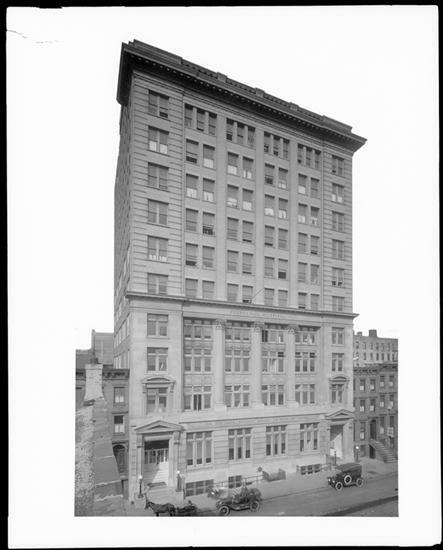 The building at 31 Desbrosses Street/440 Washington Street in 1930, during Seeck & Kade’s tenure. 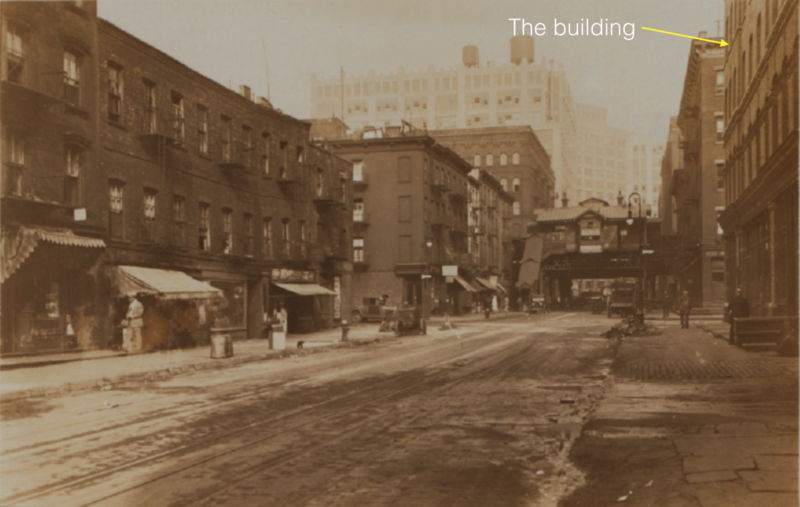 Tenement housing can be seen at left (demolished by 1940, now Tribeca Truffles Apartments), and the Greenwich Street/9th Avenue elevated train station (also demolished in 1940) can be seen in the background. Collection NYPL. Desbrosses Street in 2009. © Google. Seeck & Kade remain owners of the building until Seeck & Kade itself is acquired by Chesebrough-Pond’s in 1956, a large chemical holding conglomerate. Chesebrough-Pond’s is the last major manufacturing company to own the building at 31 Desbrosses Street. In 1967, the building is turned over to a trucking company, it’s penultimate owner before being bought by Ponte Equities, who retain ownership of the building and many properties nearby for many years. During the 19th century and into the early 20th, the Fifth Ward was a busy mercantile district, driven by the shipping industry and the many docks and shipping berths lining the Hudson waterfront. Goods and materials brought in by ship or manufactured in the city would be transported by barge to and from the West street piers and the Washington Market to rail terminals on the New Jersey side of the Hudson. Several warehouses, some dating from before the Civil War, still line the blocks between West and Greenwich streets, from Hubert street north to Canal. Built by the Grocers Steam Sugar Refining Company in 1853, the warehouse at 79 Laight street was one of the city’s tallest buildings at the time. Photo © Google. 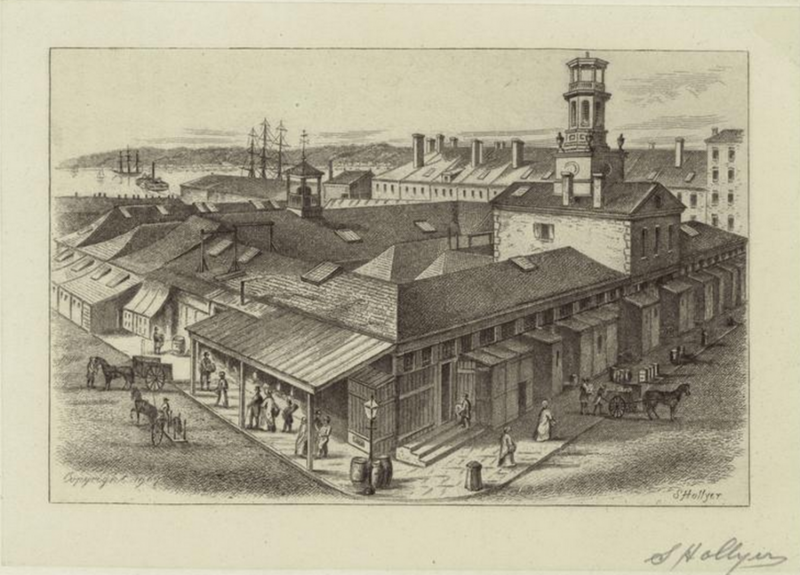 The Washington Market, 1829. Collection NYPL. 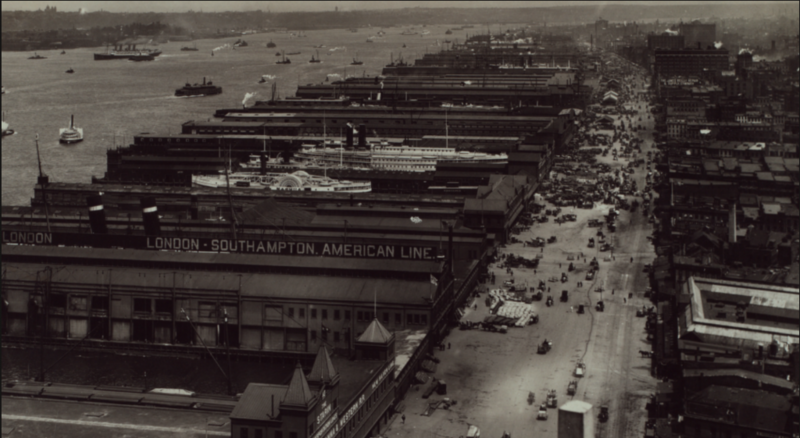 The Washington Market, a predecessor of the Fulton Fish and Hunts Point markets, was the “Ur” marketplace of wholesale commerce in the 19th and early 20th century, and was the crown jewel and hub of the west side waterfront. 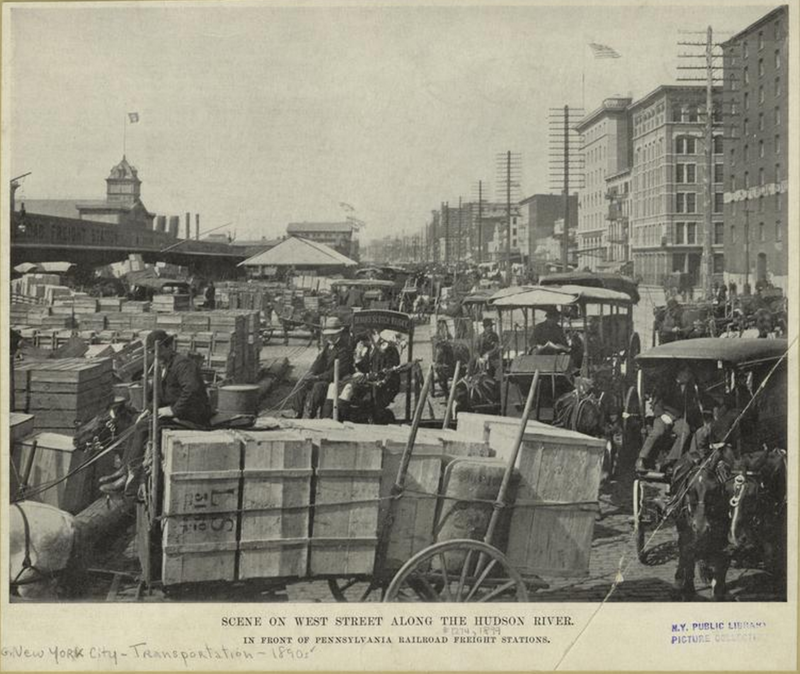 Originating as an open-air bazaar in 1812, and centered around Fulton and Washington Streets, the Washington Market was at one point the largest produce market in the United States. 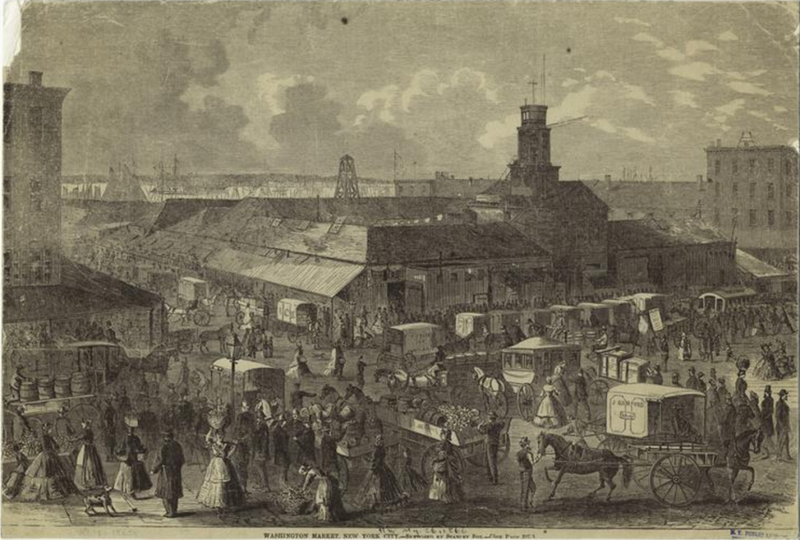 Washington Market, 1859. Collection NYPL. Much of TriBeCa during this time was the receiving point for most of the food consumed in Manhattan, and was nicknamed “The Farm” in part as reference to the sheer volume of farm produce passing through the rail corridors, warehouses, trucking depots and shipping berths along the west side and traded in the Washington Market and its environs. The Washington Market in 1956, located on the current site of the Freedom Tower. Collection NYPL. 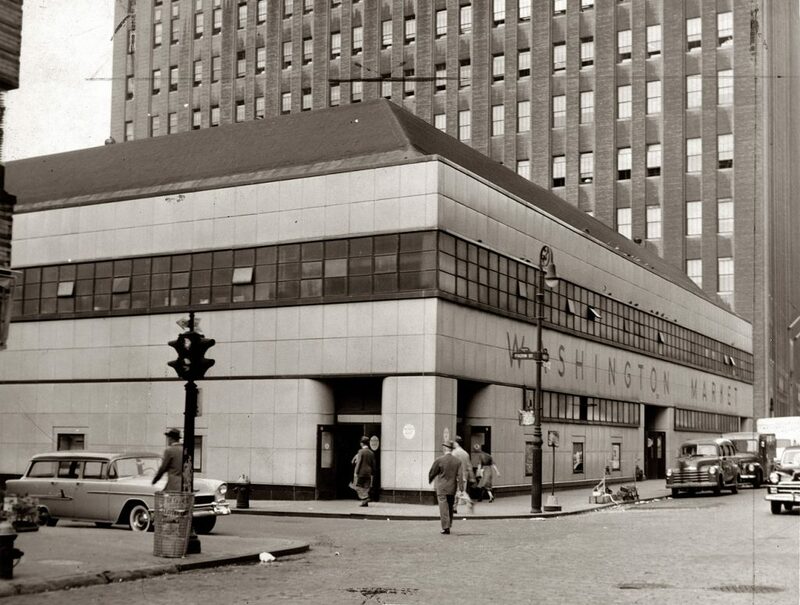 The Washington Market was closed and demolished in 1967 to make way for the World Trade Center. The Freedom Tower currently occupies the site. The waterfront began its long decline in parallel with New York City’s mid-twentieth century struggles. After World War II, New York had supplanted Paris and London as the financial and cultural capital of the world, yet economic and social forces beginning in the post-war years set the stage for the city’s gradual decline. In 1948, the Interstate Commerce Commission permitted fees to be charged by the barges transporting goods from New Jersey to the piers on the Manhattan waterfront. These fees increased the costs of transporting goods to and from the city, and prompted the decline of the ports and piers, and places like the Washington Market, as the shipping industry sought less expensive means of wholesale transportation. 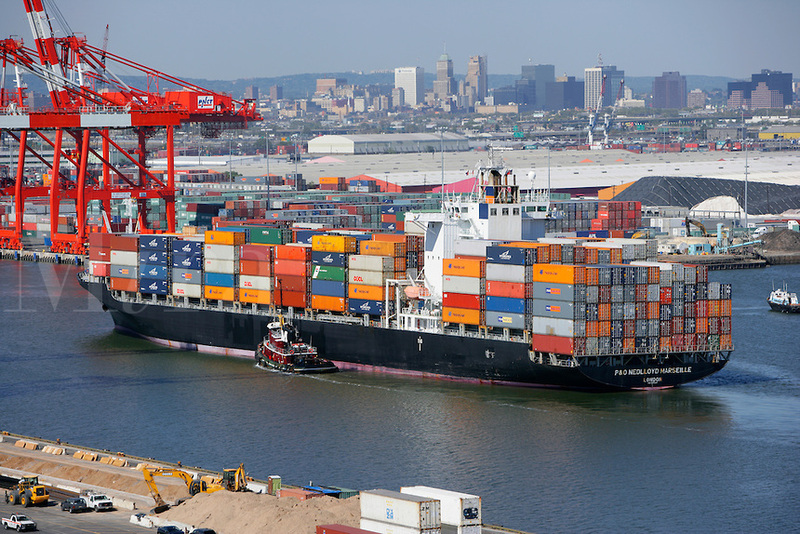 Technology too had a hand in the inevitable end of wholesale shipping in and out of the port of New York: the development of the container ship. Container vessels, first converted from tanker ships after World War II and later expressly built for the purpose of shipping, enabled bulk loading and moving of cargo at a scale and speed previously unknown in the shipping trade. The new bulk shipping containers could be loaded and secured before arriving at dockside, yet their large size, and the large size of the ships required to carry them resulted in the industry moving to the port of New Jersey at Elizabeth, where there was more space to berth and load the ships. Thus, the confluence of changing technology and modernization of large scale manufacturing and transportation resulted in the virtually complete abandonment of the west side of Manhattan as an industrial center by 1967. 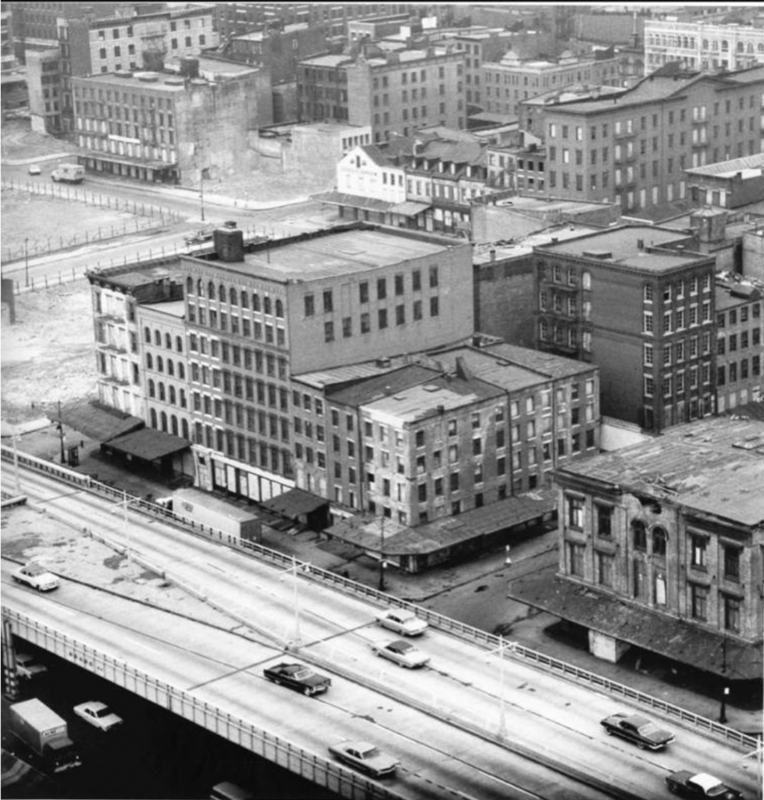 Buildings between West Street and Washington Street north of Duane Street, vacated by Eminent Domain in 1965, with the elevated West Side Highway in the foreground (demolished by 1982). Almost all of these buildings were demolished and the vacant lots replaced with Borough of Manhattan Community College and Independence Plaza, during a period of Urban Renewal from the late 1960s-1980s. 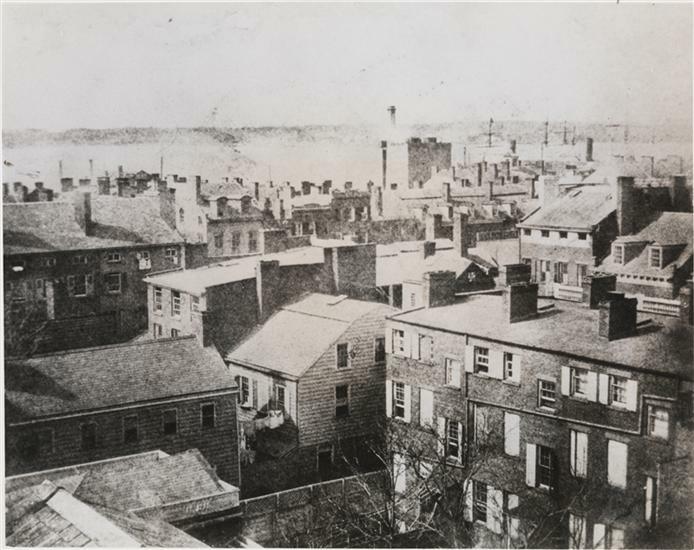 The row of three federal style houses visible in the center of the photo still stand, but were moved to Harrison Street. Photo courtesy Tribeca Trust. The population of New York City also peaked in 1950 and began to decline, as more and more people left the city in the post-war years for newly developed suburbs in the surrounding areas. The population of New York City would not return to its 1950 level again until the year 2000, with the city’s population nadir in the 1980s coinciding with the city’s economic and social woes (and ironically, the growth of its cultural renaissance). With the decline of the city’s historical manufacturing and industrial base, a declining population and economy, and increasing crime and social unrest in the 1960s, the section of Manhattan from Broadway to the Hudson River and bounded by Reade Street in the south to 8th street in the north became known as Hell’s Hundred Acres. Consisting predominantly of warehouses and industrial buildings, the area was notorious for fires, and though some light industrial activity continued and a few sweatshops remained open during the day, at night the entire area was largely deserted. 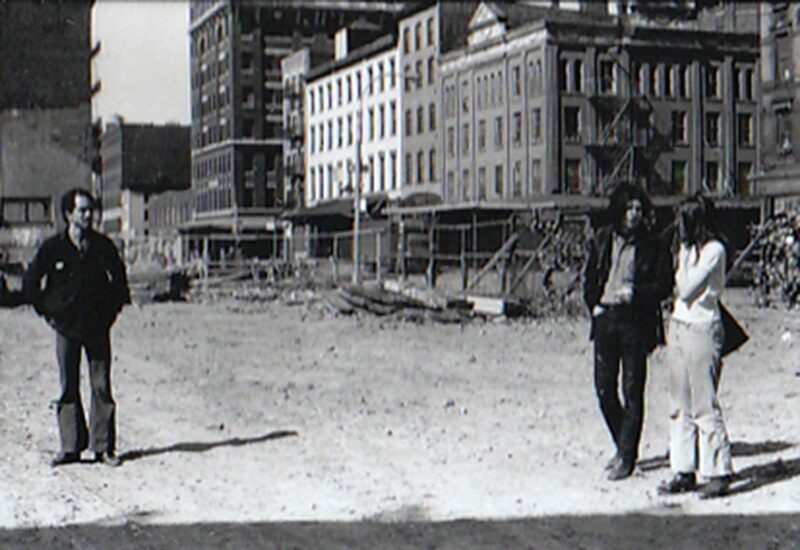 My mother and father, at right, standing in a vacant lot along Greenwich Street, now occupied by Independence Plaza, 1969. Photo by Melissa Schook, Collection Landfield family. In the late 1960s and early 1970s, a number of urban renewal projects began that transformed the lower west side, including the construction of the World Trade Center, Independence Plaza, the Borough of Manhattan Community College, and later, the Shearson Lehman/American Express complex and Battery Park City. 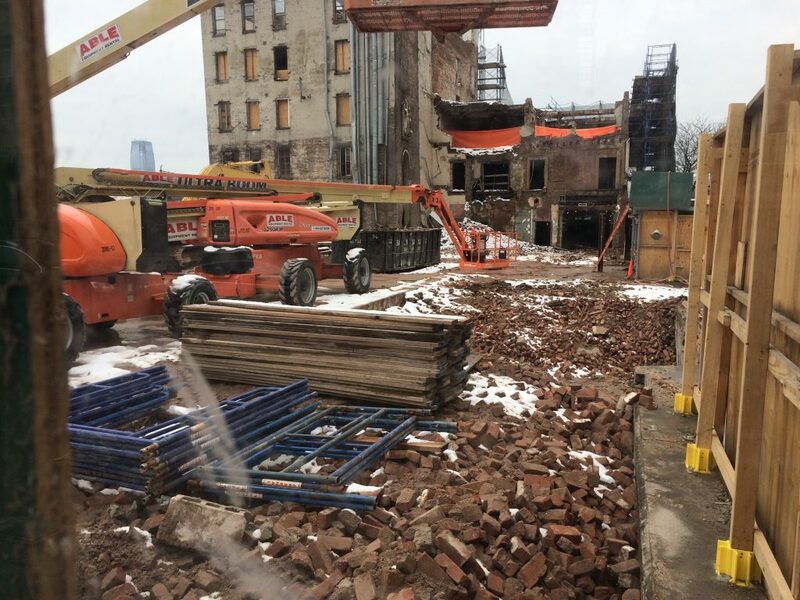 Most of the derelict piers were removed, as well as the majority of the 19th-century era masonry buildings south of Canal street along the river between West and Greenwich Streets. It was into this environment that artists of 1960s New York entered, attracted by the remaining large, industrial spaces with high ceilings and good light, left vacant by the manufacturers who had moved on to greener pastures in New Jersey or the outer boroughs. Because demand for space was lacking and the economy of the city was languishing, rents were low and little attention was paid to artists who began to live in the same spaces where they worked. Because the buildings occupied by artists were not zoned or designed for residential use, the city eventually had to create a legal framework to accommodate artist residents, and amendments were made to zoning laws to create live/work districting to permit visual artists to remain in their lofts. Later, the Loft Law of 1982 would attempt to provide rent protection and greater stability for loft dwellers who were often faced with substandard conditions, eviction, and unfair rent increases. And it was into this world that my parents found their way to 31 Desbrosses street in the fall of 1969. Uncovering the details of this narrative revealed a number of things to me. The first was that my parents and fellow artists Ken Showell and Bill Pettet were the first people ever to live on the southwest corner of Desbrosses and Washington streets. What once was water, then a storage yard, and later a manufacturing building that had never housed people suddenly became a place where my father and mother made their home. While the neighborhood had once been a working-class neighborhood for the city’s many Irish and German immigrants, with schools and churches tucked in-between the busy warehouses, those days were long gone. Now, the building at 31 Desbrosses Street stood surrounded by predominantly empty trucking depots and post-industrial derelict warehouses, looming eerily silent on the empty streets. Living at a distance from the populous part of the city defined my parents’ outlook, and would shape my early life and perspective on the city. West Street, looking east at Laight Street, 1970s. The elevated West Side Highway can be seen in the foreground (now demolished) and the Market Diner in the background (also demolished). The Grocers Sugar Refining Warehouse (at right) still stands. Collection Landfield family. Surrounded on all sides by the ceaseless traffic of the Holland Tunnel along Laight Street in the south, Hudson Street to the east, Canal Street to the north, and West Street and the river to the west, a kind of “hidden valley” was formed in the north of TriBeCa, cut-off from the rest of the neighborhood by the eddies and flows of constant motor traffic. With few residences, services, and very few retail businesses in the area, foot traffic was limited and TriBeCa North was slow to develop. In my early childhood at the end of the 1970s, there were only a handful of families who lived within a five-block radius of our house, and not many more in the surrounding area. 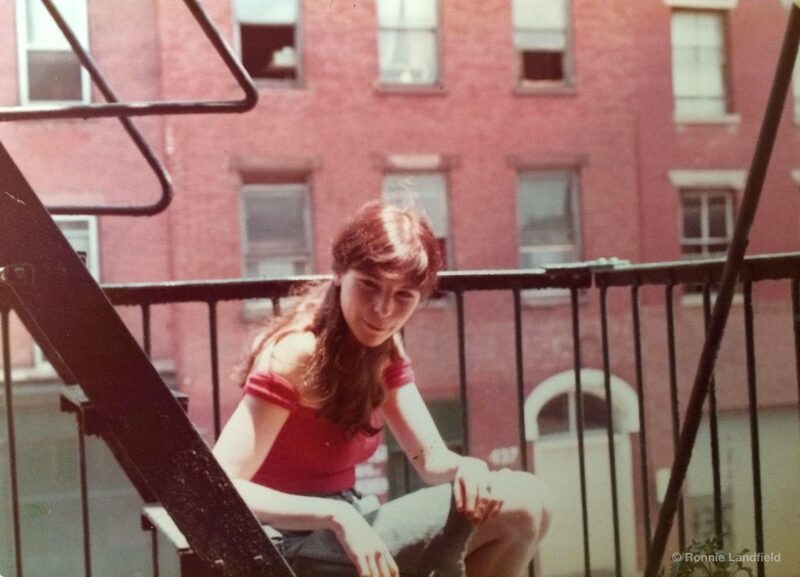 I have many memories of riding my big-wheel on the derelict off-ramp of the West Side Highway, and of walking almost a mile with my mom to the corner of Bleecker Street and 6th Avenue to go grocery shopping at the Pioneer Supermarket, the only place to buy food for miles. The opening of the Food Emporium on Greenwich Street in the early 1980s was a huge development in our household (though it was still a half-mile away). My parents would also be among the last people ever to live in the building at 31 Desbrosses Street, as they remained tenants there from 1969 until 2013 when the aftermath of Hurricane Sandy rendered the building inaccessible. They were also the only family to occupy the building continuously for that time period, as the other original tenants moved out and new families moved in. In many ways, our lives in that building and in the neighborhood of North TriBeCa formed a bridge between the city of the past, with its vibrant industrial and working-class culture — a city of workers, builders, artisans and makers — and the city of today, with its genteel atmosphere, upscale residences, and wealthy inhabitants. And my parents’ lifestyle, living on the second floor of a building fitted for commercial use, with my father’s painting studio on the floor below, while unorthodox, also oddly reflected the customs of artisans of the distant past, when craftsmen of the 18th century lived above the workshops where they plied their trade. 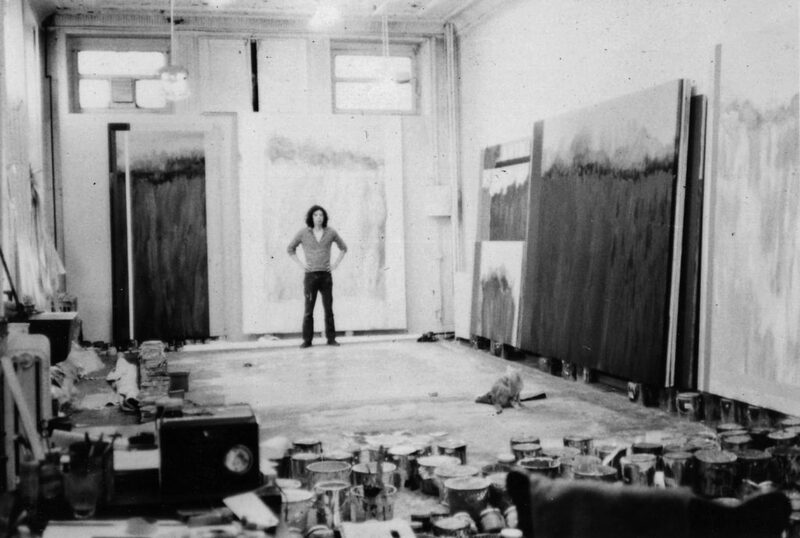 My father Ronnie Landfield in the studio, 1972. Collection Landfield family. The end product in my father’s case was art, a luxury good and a “symbolic” object, representing the “hand-made” and the “maker’s mark,” though one step removed from the utility of traditional consumer objects. Yet the methods and cultural practices reflected in the lifestyle that produced them bore more resemblance to the lives of pre-industrial artisans than it did to the industrial and post-industrial workers of the modern world. That the product was art rather than consumer goods reflected a changing culture and the changing times. Many artists in the area during this time lived in a similar manner, and it is in many ways the joining of old methods and customs with new ideas, economic realities and cultural ferment that set TriBeCa on its path to becoming the heterogeneous mixture of old and new that it is today. 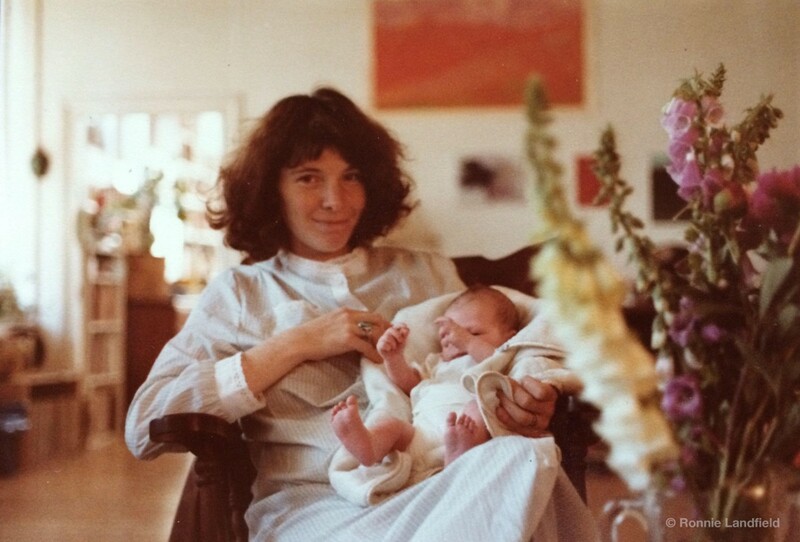 My mother Jenny with my brother Noah, 1979. Collection Landfield family. Raising a family in this environment also created its own incongruities. Children need schooling, and by the late 1970s, Ronni Moskowitz had started the Washington Market Montessori School, and PS 3 Annex, which would become PS 234, occupied a small three-story building within the Independence Plaza Complex (now occupied by PS 150), led by pioneering principal Blossom Gelernter. My brother and I, and virtually every other child of artists we knew in the neighborhood (and some from other neighborhoods) became students there. The small school, where there were no desks and the teachers were called by their first names, became the center of our community, and as we grew we watched as the neighborhood grew around it. Washington Market Park, down the block from the school, underwent a transformation from a spartan sand-lot with a jungle gym or two, to the bucolic gem of urban green space it is today. The rapid transformation of lower Manhattan going on around us felt at times like a Bugs Bunny cartoon, the one where the cartoonist’s gigantic hand appears in the frame holding a pencil, and in a flurry of “meta” storytelling, sketches in the scene surrounding Bugs as the action unfolds, sometimes one step ahead of Bugs, sometimes just a few steps behind. So too do the changes taking place now feel like the same cartoon, this time where the cartoonist has flipped the pencil, and erases the scene around Bugs Bunny, leaving him in an unfamiliar and unsettling blank void. The changes that were taking place in the neighborhood and the city around us ran like seams through our lives. My brother was one of the first classes to attend school in PS 234’s “new” building on Chambers street (a building it has now occupied for almost 30 years). By the time I was 16 years old, Stuyvesant High School had finished construction of the ten-story building it now occupies in Battery Park City at the corner of Chambers and West Streets, just in time for my Junior year. I was in English class in 1993 the day of the first bombing of the World Trade Center. And my family was at home on September 11th, 2001, as the planes struck the towers. For weeks afterward, my parents were confronted with checkpoints on their walk home from the subway, and the metallic smell of the fires lingered for what seemed like months. And, the gap left in the sky downtown was a cold reminder of a new reality — the quiet, peaceful village we had known was gone almost over night, and a creeping sense of unease settled in and stubbornly persisted. Today, the neighborhood has grown exponentially, both becoming more populous and more affluent. Like the settlement of St. John’s Park in the 1820s, TriBeCa has once again become a destination for the city’s wealthiest and fashionable denizens, albeit on a far grander scale. 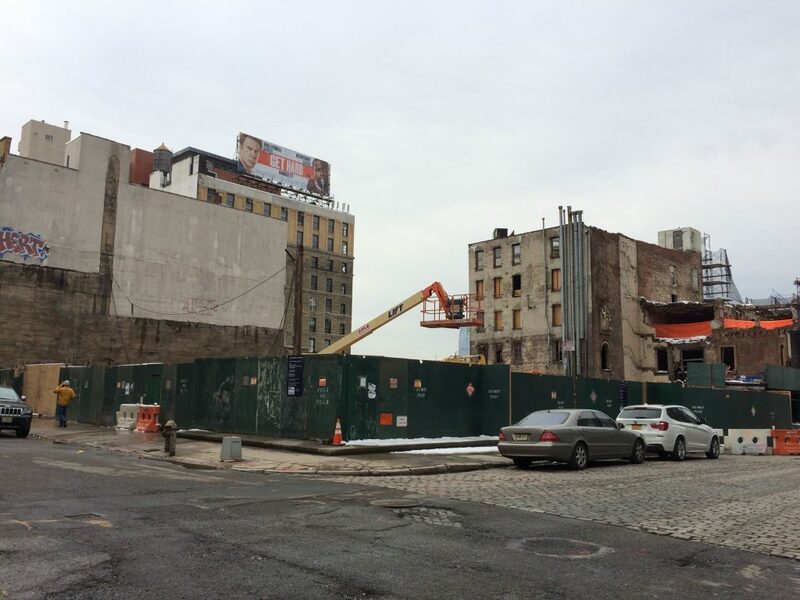 And as a result, TriBeCa — including North TriBeCa — has become prime real-estate for developers looking to cash-in on the caché. Uncovering the history of the neighborhood revealed that the changes taking place there are part of a continuum, part of the growth and regrowth of the city and our society as a whole. It also demonstrated that nothing takes place in a vacuum. Yet, seeking — and finding — the origins of this one particular spot, the land underneath my former home, also revealed a deeper truth. Hugh Gaine and the other property owners of the late 18th and early 19th century remade the waterfront to fulfill a vision of New York as an engine of maritime commerce and growing industrial power. Not content to abide within the natural boundaries of the island, they reshaped the geography of the land to accommodate their ambitious project, and pushed the river’s edge back from its high water mark further and further out into the effluvial channel. They forced nature to their will, forming and reforming the land to suit their needs. In the two centuries that followed, the use of the waterfront reflected the changing character of the city, from pre-industrial port town, to bustling industrial city with steamships, railroads, warehouses and storage yards, to blighted metropolis whose derelict piers and empty commercial spaces would form the fertile, fallow ground in which a new city would emerge. The city of my lifetime transformed from an urban wilderness, where inhabiting the large swaths of post-industrial Manhattan was a new idea, to the settled Millennial city, tamer and taller, where the human-scale legacy of the industrial age was sloughed off and replaced with glass towers that loom high above the streets like lofty titans. Each successive wave of change built on and adapted to what the previous generation had left behind, shaping and reshaping the landscape to accommodate the social and economic forces at work in each period of history. The destruction of the World Trade Center, and the economic crisis of 2008 slowed, but did not change the trajectory of transformation taking place in lower Manhattan. Where the builders of the 19th century and the city planners of the 1960s expanded the boundaries of the island horizontally, a new vision of the city is emerging, one in which the boundaries of the city are expanding vertically. Driven by the social and economic crucible that is 21st century America, and the forces at work in this more and more divided city, the relentless flow of energy that gives New York its strength is the same energy that strips it of lasting character and identity. Unable to preserve its past, the city cannibalizes itself, growing and regrowing to meet the needs of its population and the insatiable demands of capital. The small strip of TriBeCa North that once was my home is no different; in a way, the drama that took place there over the course of two centuries is a perfect pageant play of the current moment in the history of New York City: the old giving way to the new, the human, artisanal scale of a place retreating before the impersonal bend of progress. In some ways tragic in the erasure of history and the physical forgetting of a city’s legacy; in other ways, simply another phase in a long journey of transformation. But there is another force at work that may represent a more pressing and urgent future than we are aware. 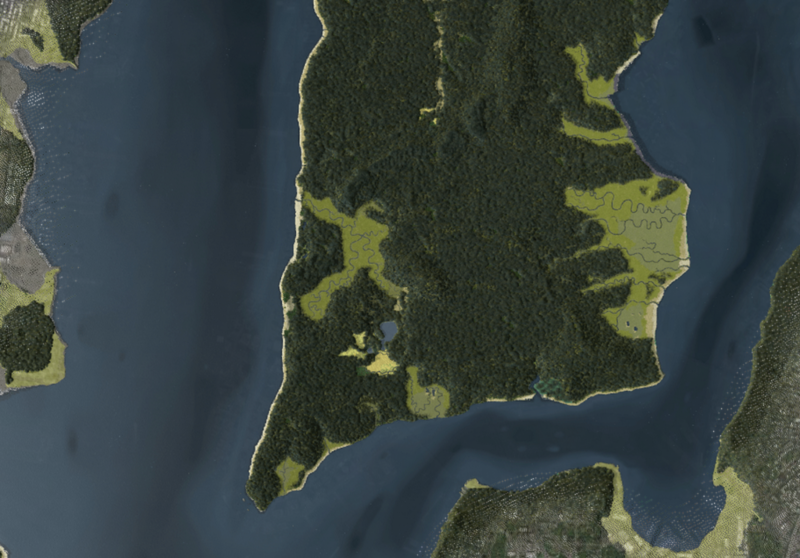 The River itself — and the estuary where the Hudson meets the Atlantic Ocean — was the original claimant of the land, and may yet return to reclaim what was lost. If Hurricane Sandy prefigures things to come, the effects of climate change and rising sea levels will devastate and undo all of the development that has taken place around the Manhattan waterfront from before the time of Hugh Gaine. What once was water will return to water if no measures are put in place to safeguard the city from the relentless forces of nature. Though perhaps that fate is all but unavoidable, and the four-odd centuries of urban development will be but a brief and fleeting moment in an enduring dance played out between the river and the sea. 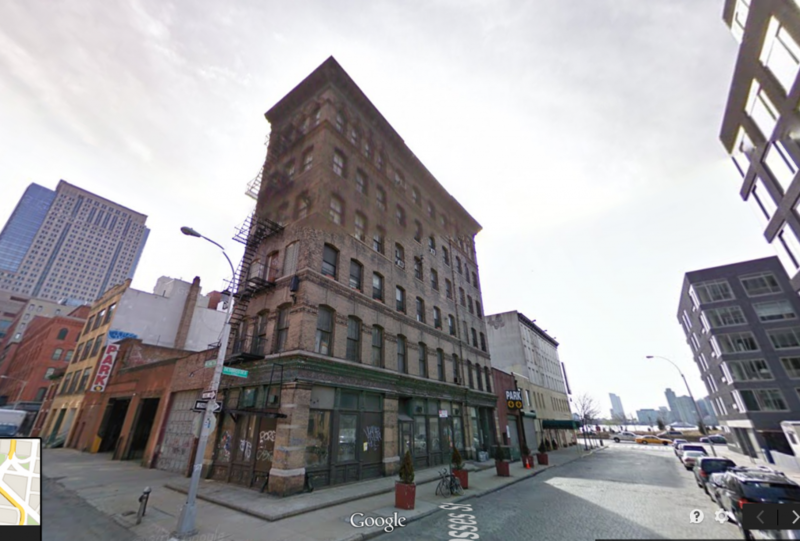 More buildings in TriBeCa North are vulnerable to demolition. To learn more, and to support the effort to expand the Tribeca Historic District, visit the Tribeca Trust. I am indebted to a number of individuals and organizations for their support in writing this article. The staff at the New York Public Library and their online archives, Lynn Ellsworth and the folks at the Tribeca Trust for their knowledge and research, the The New York City Department of Records and The Department of Buildings, The Landmarks Commission, The archives of the Museum of the City of New York, Welikia.org, the incredible resources available through Google Search, Google Maps, Google Earth, and Google Books, Ronnie, Jenny and Noah Landfield, and most of all, Caitlin and Benjamin for going with me the whole way. Want more stories like this? Know some facts or details that I should know? Let me know what you think by leaving me a note! Correction: A reader pointed out that the photo of Urban Renewal from 1965 shows the blocks north of Duane Street between West and Washington Streets, not North Moore street as previously stated. The biggest thing missing from Virtual Reality: Shared Experience. He dashed off down the hall to retrieve a small cardboard box sitting by the mailboxes. 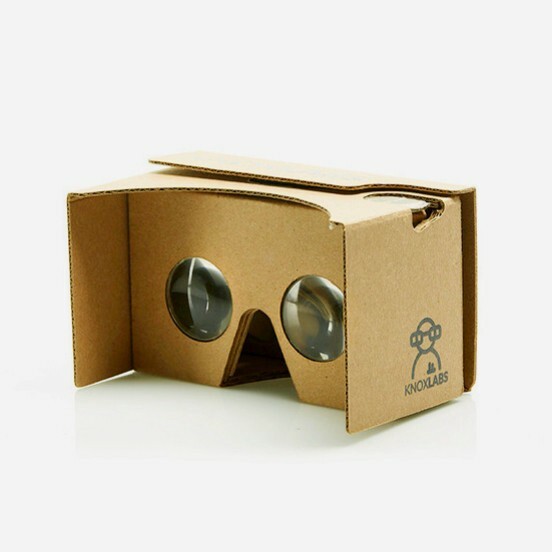 The Knox V2 — Google I/O 2015 Google Cardboard kit by Knox Labs. Image ©Knox Labs. Explaining something like Google Cardboard to a seven-year old is much easier to do when you have one in your hands. So, being more than a little curious about “Virtual Reality” (and not being a New York Times print subscriber), I had ordered a couple of Google Cardboard VR kits from Knox Labs to see what all the fuss was about. Still I was surprised at just how excited my son was to try “the VR” (as he called it), even though the only thing he understood about virtual reality was that you can use it to play games, and you wear it on your face. Once we got the box home, we opened the package and assembled the kits. We unfolded and velcro-ed up the viewers, downloaded the Google Cardboard app, and dropped the phone into the headset. Before I’d even had the chance to set it up, the headset was in my son’s hands and he was walking through the tutorial. “Dad, where’s the button?” was the last question he asked before quickly grasping the basics of the single-button interface, and the “tilt-to-go-home” controls. The virtual reality part — the immersive, 360 degree view, accelerometer-controlled, “move-your-head-and-see-in-any-direction” environment came naturally. The next several minutes were punctuated by “oohs” and “ahhs” and “wows,” while my son wandered around the room exploring the virtual environment and the clever features of the app. My wife, equally curious, got the second kit out and was quickly immersed in the viewer, swiveling her head around in different directions. Watching my wife and son use this incredibly simple and at the same time strangely alien device immediately brought to mind one very simple yet very important thought — they were having a rich, immersive, novel, intense and enjoyable experience — yet they were having it completely alone. They were both enthralled by the sensation of peering into a little cardboard box and stepping into a radically separate, private visual bubble, yet the experience they were having was strictly solitary— and in some ways, completely isolating. I couldn’t help but compare the experience to one we’d had only a few days before, when the three of us cuddled together on the sofa to watch a movie on DVD—intimate family time, and a familiar shared experience. 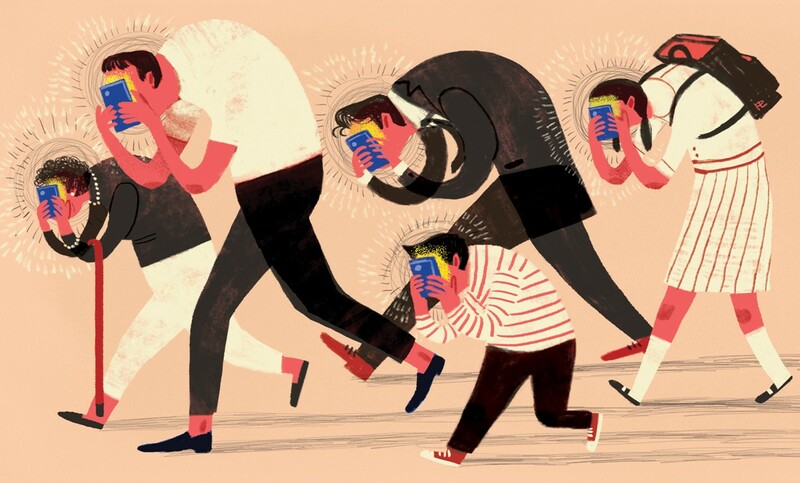 The sense of disconnect I observed was similar to the inter-personal atomization taking place throughout our lives, as a bi-product of device and screen distraction— yet this was an order of magnitude different: device distraction on steroids. By completely occluding their visual field of view, my wife and son were in worlds of their own, having parallel but separate experiences. This sense of separateness was increased even more when they used headphones to enter an enclosed auditory environment, essentially transporting their awareness entirely into an alternate reality. Watching them move around within these private bubbles reminded me of watching people tripping on psychedelic mushrooms—hallucinating, basically. The potency of the virtual reality experience was undeniable, underscoring yet again how powerfully smartphones and mobile devices are transforming our lives. With a smartphone, a pair of headphones, a cardboard box (and a couple of lenses) we can transport ourselves into a totally digital world — almost like sticking our whole heads inside the phone itself. However, the fundamental isolation of parallel, individualized experience using VR tech should not go unremarked. Digital isolation is nothing new — we’ve been debating whether technology makes us lonely for a long time. And while social media connects us through common digital interfaces, increasingly our experiences are growing more and more personalized, algorithmically tailored to our habits and interests—parallel, individualized interactivity. Yet the degree of sensory isolation with virtual reality is new. The only true analogs to immersive “virtual” environments of the kind we are beginning to see with virtual reality are the private worlds we inhabit while dreaming, and the blending of consciousness and the unconscious that takes place during psychedelic hallucination. Both of those aspects of the human experience can be very powerful, and they can also be very frightening. When we hand over control of our senses, the trust we place in that experience becomes very important. And when we face it alone, doubly more so. No doubt, many of the technology companies at work on Virtual Reality, Augmented Reality and Mixed Reality tools are developing solutions to the shared experience gap, and some are already here. More are likely on the way. Indeed, why else would Facebook have bought Oculus Rift for $2 billion if not to create some kind of shared virtual experience? The alienation that many of us already observe in connection with smartphones and the social fabric is only made more acute by a technological experience that fully absorbs our senses and that significantly reduces our ability to communicate directly with those near to us. Working out the obstacles to a truly shared experience is, in my view, perhaps the most important challenge confronting virtual technologies and their broader cultural acceptance. More than looking goofy while wearing a VR headset, being cut off from the people around you is far and away the biggest challenge that VR will face. At the Bread Factory: How filmmaking and bread-baking have a lot in common. The roof deck at BKLYN Commons. In 2016, TimeTravlr Creative moved offices to BKLYN Commons, a new co-working space in Brooklyn. Prospect Park is around the corner; the Brooklyn Botanic Garden is across the street. The building itself is the former Bond Bakery building, a majestic, aging factory built in 1925. 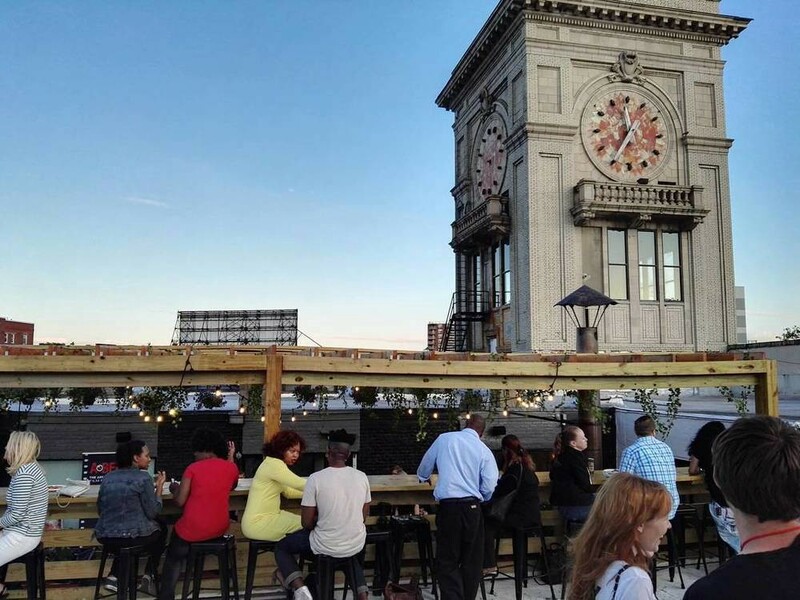 The no-longer-operational clocktower still marks the gateway to Prospect-Lefferts Gardens (PLG) and greater Flatbush from brownstone Brooklyn, and the once-beloved bakery was known for wafting the yeasty aroma of freshly baked bread throughout the neighborhood. No bread is baked in the building now, but here at TimeTravlr Creative we’re doing a different kind of baking. Though you won’t find any yeast, flour or salt in the TimeTravlr offices, making bread is actually an apt metaphor for the filmmaking work we do here on a daily basis. Here are a few of the things making bread and making films have in common. Start with a Great Recipe. You would never set out to make a delicious loaf of french baguette or tasty caraway-rye without a terrific recipe (unless of course you’re already a master chef, which is kind of saying the same thing). The same is true for filmmaking. Having a clear plan in place before you get started makes the process that much more effective, ensures that you and your team are tracking toward the same result, and gives you a much better chance of coming out in the end with something that looks a lot like what you set out to produce, so that you don’t end up with a bunch of rolls when you meant to make kouign amann. Ingredients Matter. Just as making a delicious crusty loaf of bread depends on having the right mix of the right ingredients, the quality of the films we produce depends completely on what we put into them. Having the right team and the right tools in place — from camera, sound and lighting, to logistics and creative direction — and bringing the ingredients together in the right way, is what makes for a successful film project that yields delicious results. Good Results Come from a Good Process. To make good bread, you have to knead the dough. The same is true with films. The editing process is a lot like kneading: once we’ve gathered the footage for our film, we spend time massaging the material, pushing and prodding and mashing it up to get the gluten-y goodness of story to bond and gel together. While some films can be cut in a flash after only a gentle “knead,” most of the time, editing is a rigorous process that involves a lot of forearm strength, a few rolling pins, and believe it or not, a razor-blade or two. Who knew filmmaking could be so messy? And, just as dough can be over-kneaded, films too have to be carefully handled, or one runs the risk of pushing too much air out of them. Over-cutting can be just as detrimental as under-cutting. Letting it Rise. A good film, like a good dough, needs time to take shape. Giving a film some time to settle (or your own mind to settle) is as important as slashing the dickens out of that film. Taking time away from an edit to get perspective is as critical as letting the dough prove away happily in a corner of your kitchen. The Bake. Once the cut is finished, or the dough is risen, it’s time to bake. That means sound mixing, color correcting, outputting, and throwing the dough into a burning hot oven and waiting for it to turn into bread. Seriously, do not underestimate the importance of the bake. Getting that film out there without going through the necessary finishing steps can be akin to throwing a big blob of dough on the table and calling it bread, or smacking a huge hunk of burnt crust down and declaring it “delicious.” I don’t know about you, but I’m pretty sure everybody can tell the difference. Presentation. Ah yes. Presentation is everything. Just as a baker would never just toss her loaves in a pile or roll them across the floor, how you present your film can make all the difference. Setting your film apart with a pretty package—from things as simple as which thumbnail you choose for YouTube, to what your poster art looks like, to how you optimize for search — can mean the difference between a lump that sits in a corner untouched, and a delicious centerpiece that everyone can’t wait to enjoy. Sometimes your marketing needs marketing, and presentation matters. That Special Something. None of this would mean anything at all without that special something. You can have the finest ingredients and the best people together on a project, but without that special something, that extra pinch of love, care, and je ne sais quoi, you can easily end up with a pile of tasteless nothing. Vision, craft, inspiration, magic. Daily practice. It’s the difference between that perfect loaf and one that’s only “meh.” You wouldn’t want to eat a loaf of “meh,” would you? Yet so many of us do, because we’ve forgotten, or we’ve never been shown that going that extra mile can make such a big difference. Films are the same. Without that spark of love, your audience will chew politely, nod and smile, and then spit what you’ve served them in the nearest potted plant when you’re not looking. Don’t bake lousy bread. Give us a call. At TimeTravlr Creative we know that Great Stories Change Lives. And that baking good “bread” takes patience, care, and hard work. We love working with our clients to ‘bake’ great stories that make a difference. Have a story that needs to be told? Please get in touch! The Fortress of Solitude isn’t just the title of a Jonathan Lethem novel. Originally it was Superman’s secret hideout, a piece of his home planet Krypton on earth, where he could go to remind himself of his true identity. It can also be an instructive tool for succession planning in family philanthropy. In Richard Donner’s 1978 film Superman, a young Clark Kent travels to the arctic wastes at the north pole, and deposits in the ice there a crystal that accompanied him on his journey from the planet Krypton. A fortress grows from this crystal, and inside the fortress Clark discovers a library of knowledge — holographic films of his parents detailing the legacy of his family and of his home planet Krypton. Clark studies these films, and uses the knowledge they contain to learn about himself, complete his education, and become Superman. Still from Superman, 1978, ©Warner Bros. Superman in the Fortress of Solitude. Superman uses the library of “films” embedded in crystal to gain knowledge of his family’s legacy. While the Fortress of Solitude is a fictional place used by a comic-book superhero, the notion of capturing a family legacy in an easily-transmittable form that can be shared from generation to generation is a very real and tangible goal that can be achieved by almost any organization. Moreover, the notion may even be an apt metaphor for some of the most important precepts of family philanthropy— legacy, continuity, and a vision for change in the world. Indeed, the Fortress of Solitude was the first thing that sprang to mind when, in January of 2017, the leadership of the William G. McGowan Fund reached out to us with a request: could we help them document and transmit the wisdom, knowledge and expertise possessed by the fund’s current board of directors in a form that would be accessible to future board members. A tall order, by any stretch. Recent statistics indicate that almost 50% of family foundations report succession as their biggest challenge, and a silver bullet to solve such a complex problem in a comprehensive manner might be difficult to achieve — even if we’d had the benefit of Kryptonian holograms or crystals that grow into fortresses! Nevertheless, we gave it some thought, and with many subsequent conversations with our clients at the McGowan Fund, we arrived at a solution that we came to call the McGowan Legacy Project. During discussions with the fund’s leaders, we identified several areas of inquiry pertaining to the work of the board that would be relevant to new board members stepping into their duties for the first time. Among these areas were the board’s biggest challenges and successes, including the transition from one leadership regime to the next, how board members work through conflicts and balance their responsibilities as board members with being related to one another (not always easy! ), as well as the nitty gritty details of their fiduciary responsibilities, their vision of the future, and their experiences working with (and sometimes being!) outside trustees. To synthesize these questions, and to contain the answers to them in an accessible form, we chose to create a series of four short films, each roughly five minutes, in which we would interview the board members and capture their feedback on camera. Portions of each interview would then be combined with portions of the other interviews to form a “chorus-of-voices” short film, in which each board member would weigh in on the topic or topics of focus. We divided the films into four broad topics, A 25-Year Evolution, capturing an overview of how the fund has evolved over time, A Family Board, focuses on how board members manage their family relationships as well as integrating input from outside (non-family) trustees, A Guiding Legacy looks at how the fund’s original benefactor William G. McGowan and the founding generation of the fund set a course which guides decision-making even today, and the fourth and final piece, Continued Evolution, gives the board members a chance to share their thoughts on where the future of the fund may lie. As with any complex documentary film project, the process began with a pre-production phase, in which we honed in on the questions we planned to ask each board member, and a scripting phase in which we imagined what and where in each film we might want to hear from each board member. Getting everything down on paper was a lengthy process, but it made it that much easier for us to communicate with our client how we envisioned The Legacy Project coming to life, and gave them a sense of confidence that we weren’t simply embarking on a fishing expedition looking for answers that we might not find. We also proposed the idea of enlisting the help of one of the newer members of the board, Father Kevin Fitzgerald, who had been affiliated with the organization for many years, but was only this year becoming an official trustee. Our theory was that having someone familiar to the board conduct several of the interviews might help to elicit more candid responses to certain sensitive lines of inquiry than an outside interviewer might. Father Kevin and the fund leadership were open to the idea, and we agreed to try it. We shot fourteen interviews over the course of three days, during the fund’s summer board meeting, with members shuttling back and forth to our interview studio between sessions throughout the course of their meeting. We used a device called an Interrotron (a name coined by documentary filmmaker Errol Morris, who pioneered the technique), which is a clever rigging of two cameras and teleprompters together which makes it so that the interviewer and interviewee can see each other on the screen of each teleprompter. It’s essentially the same idea as FaceTime on your phone, except that instead of looking “up” at the tiny camera above the screen, the screen itself becomes the camera (hidden behind a two-way mirror) to create the illusion of eye-contact between the subject and the audience. Father Kevin Fitzgerald, conducting an interview via interrotron at the offices of the McGowan fund, July 2017. William P. McGowan, Chairman of the McGowan fund, speaks to Father Kevin via Interrotron. William P. McGowan, in a still from one of the final films. With the interviews in the can by the end of July, we set to work editing the films for a release date in early November. After some discussion, we agreed that the easiest way for our clients to handle reviews of each piece was to treat them as parts of a greater whole. So rather than embark on independent review cycles for each piece, we cut all four of them simultaneously and then reviewed them together, which made it easier to identify overlap and missing areas that needed to be covered. In addition to the interviews, we added archival photos and video clips from news reports and some older documentaries that had been produced about the founders of the fund. Once we’d pulled all of the materials together and shaped the interview narrative for each short, we were pretty close to a finished product. With a sound mix and color pass, we were able to make sure that everything balanced out nicely. We converted our studio into a color lab for a day, bringing in calibrated monitors and a mobile DaVinci Resolve rig to finish everything to a broadcast standard. At last the films were done, and we delivered them to our clients at the McGowan fund in time for their annual Symposium at the beginning of November. Why do all of this? Did these films actually translate into success for our clients, the McGowan fund, and by extension, their existing and prospective board members? Did these films fulfill their purpose, and serve as a kind of ‘Fortress of Solitude’ for the McGowan fund and the fund’s trustees? The answer to those questions will play out over the course of years as the fund puts the films to use, sharing them with new and prospective board members, and looking to the wisdom of the current board, captured in these films, for solutions to the problems of the future. Part oral history, part branding exercise, part documentary, part internal-cheerleading tool, the McGowan Legacy Project represents an approach to storytelling that uses technology to capture the knowledge and wisdom of leadership and transmit it to the next generation in an accessible and emotionally resonant way. By approaching the video series as an invitation to dialogue rather than a presentation, and structuring the process as a conversation rather than a series of bullet-points to hit, we were able to craft a ‘film-document’ that is both informative and engaging, instructive and accessible. The success of the McGowan Legacy Project over the longterm will be a testament to the forward-looking and proactive leadership of the McGowan fund’s executive director and board leadership, who recognized the value of the knowledge possessed by the current generation of board members, and made an active effort to document that expertise. As board members move on and pass the torch to the next generation, retaining the expertise and knowledge they have accrued becomes a valuable asset to the fund itself, and finding ways to extend the longevity of that asset becomes a necessary function of responsible leadership, helping to smooth the transition to new generations of leaders. Crafting content that keys in on emotion and not just information delivery is critical to landing the message you’re trying to send. Whether you’re aiming to educate the next Superman, or simply introducing a new generation of trustees to the work of a family foundation, landing your message can be as much about how that message is structured and presented as much as it is about what you are trying to say. Not every piece of content can or should be the next viral hit, zooming across the internet and racking up millions and millions of views. Sometimes the only audience that matters is an audience of one or two. But regardless of the size of the audience, the impact your story can make should never be underestimated. By bringing to bear all of the emotional tools available to us through filmmaking, we can ensure that the messages we send land with enough emotional punch to be remembered and carried forward for a long time to come. At TimeTravlr Creative we know that Great Stories Change Lives. What do you think? Can the Fortress of Solitude provide other lessons for philanthropy? Please share your thoughts with us here. Five Things We Can Learn from 10,000 year-old Americans. I reached down, and picked up the stone. It didn’t look like the other rocks on the beach. It was triangular, with gently curved sides tapered to a point, the surface and edges marked with dips and curves, as though someone had scooped the surface with a tiny spoon. And the cross section appeared oval-shaped and nearly symmetrical, each end tapered to a gentle point. Here was clearly something shaped by human hands and very old, buffed by untold seasons in the wind, waves and sun, worn and smooth to the touch. Back at the house in the tiny fishing village off the coast of Maine, I asked our host Phil if he had an opinion on the find. Back home in New York the following week, I sent photos of the object to several professors, curators and archaeological societies around the Northeast in hopes that someone could help me identify it. A geologist at Williams College held the opinion that the stone was rhyolite, a material commonly used by paleo-Indians for stone tools and weapons. 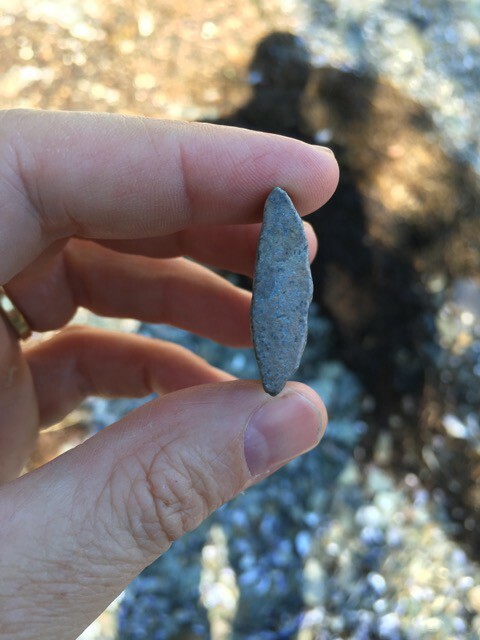 There was a source of rhyolite not far from the beach where I found the stone, and he surmised it could have come from there — but as archaeology was not his field, he couldn’t identify the object any further. 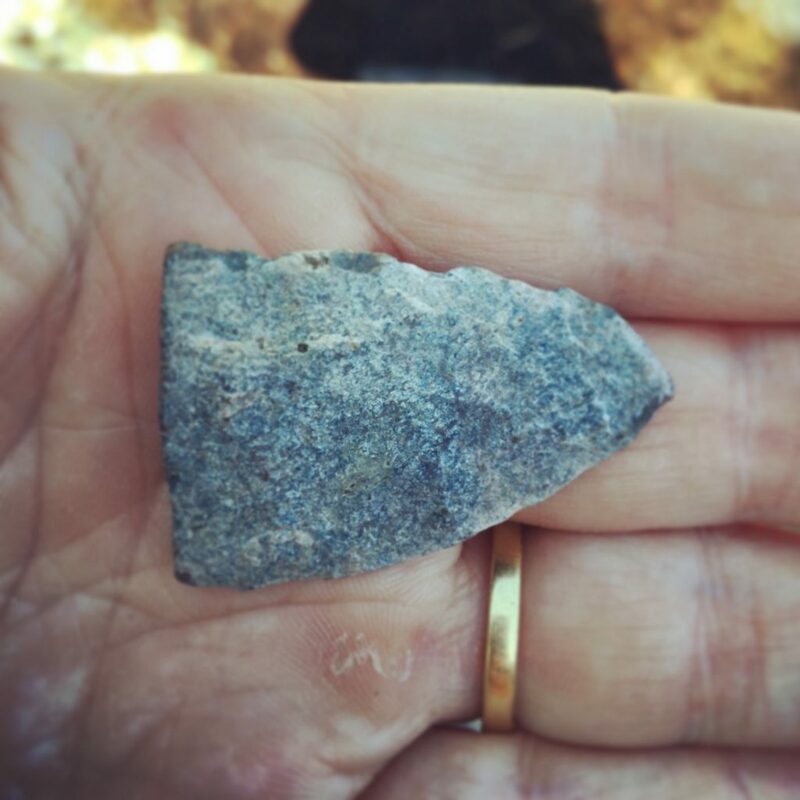 I heard from Dr. Arthur Spiess of the Maine Archaeological Society, and Julia Gray of the Abbe Museum in Bar Harbor, Maine, who both agreed that the artifact was not an arrowhead, but actually the distal (pointy) end of a stone knife, blade or spear point that had broken from the haft, likely while it was still in the possession of its creator. They placed the date of its creation at some point between 500 years ago (pre-European), or as far back as 6000 years, near the time the last ice age came to an end. This got me to thinking about the ancient people of North America—what archaeologists now call paleo-Indians — the native people who lived on this continent in the millennia following the end of the last ice age. We’re talking 11,000 to 1000 BCE. The ancient people of that time lived through something that hasn’t happened in almost as many years, but is beginning to happen again now: climate change on a global scale. Archaeologists believe that the Red Paint People, so named for the red ochre or iron oxide powder found encircling their burial sites, may have lived in coastal settlements near the mouths of rivers, all the way out to the edge of the continental shelf on land that is now submerged beneath hundreds of feet of ocean. 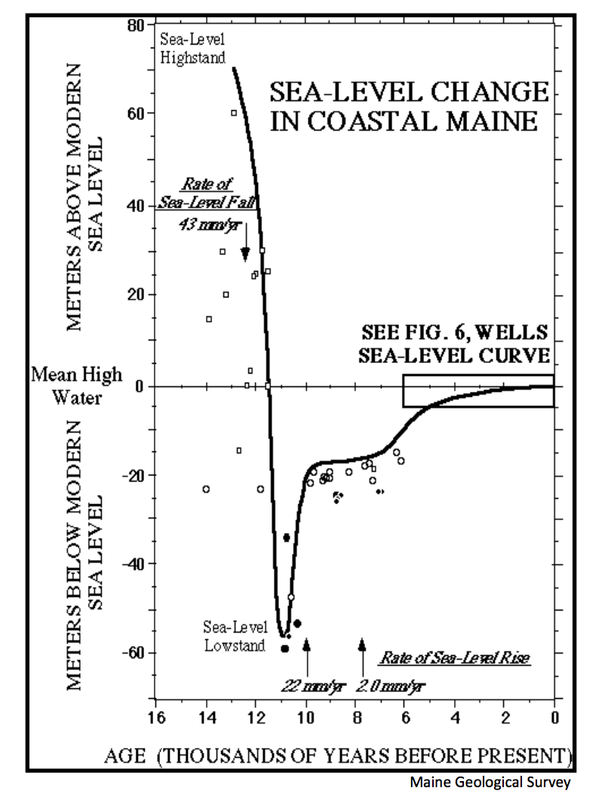 Maine’s local relative sea-level curve for the past 14,000 years. likely rose to near their current levels. But sea level rise isn’t the only reason we know so little about the Red Paint People, or that their land is under water. The geological process of Subsidence — essentially, one part of the earth’s crust being pushed down by another part of it — also occurred, forcing the land to sink beneath the water at twice the rate of global sea level rise. The result is that huge swaths of coastal ice-age North America vanished underneath the ocean in a relatively brief period of time. How did the ancients react to massive coastal flooding on a catastrophic scale? What did they do to survive? These questions led me to even more questions, which are hard to answer given the yawning stretch of time between us and the peoples of the past. They left no writing, and the few artifacts they did leave behind provide only glimpses into their way of life and their history. Yet native peoples continued to inhabit North America, and still live here today, despite facing several periods of near extinction. How then, does a culture survive for 10,000 years or more? We don’t really know conclusively when the first peoples came to the Americas — some believe the genetic and archaeological evidence may point to multiple points of arrival, and dates stretching back as far as 30,000 years ago. If that’s the case, The American Indian has lived on this continent continuously for thousands and thousands of years, while our modern industrial society has only been around for two centuries and change. And we’re already feeling the pinch of resource depletion and environmental destruction. Now, at a moment when Native peoples and their advocacy for the earth are again emerging into the public consciousness for the first time in decades, and perhaps at a scale that hasn’t been seen in more than a century, what lessons can we learn from the legacy of the indigenous humans who were the first pioneers in this continent? Can we look to them to learn to sidestep climate change? Here are five takeaways on living in harmony with the earth that we can glean from a culture that has our society beat on longevity by a factor of fifty. Know your environment. Plants, animals, water, shelter, weather, seasons, to name a few. The paleo-indians were intimately familiar with all of the elements of their surroundings. They learned to identify the plants in their vicinity and how to use them. They learned how to live with the animals. How to survive in their habitat in a way that supported their communities, but considered the impact their decisions would have on future generations. Respect your resources and don’t get too greedy. The first peoples intuitively understood that their survival depended on the plants and animals of their environment, and while they lived in geographies with abundant fish and wildlife, they were cautious and conscientious in how they extracted value from those resources. They took what they needed, but remained mindful that if they wanted to enjoy those resources long into the future, they would have to be moderate in the way they used those resources today. Use everything, don’t waste. It’s an age-old trope that indigenous cultures used all parts of the animals that they hunted — the meat for food and skins for clothing, the bones for tools and adornments; waste was a form of sin against God. The mindset of using what you have because resources are precious is a central tenet of their beliefs. Don’t get too comfortable. Nomadic people moved around a lot — living off the land sometimes means that the land you’re living on is no longer livable; hence you have to move to survive. The early peoples of North America lived in such a way as to follow their sources of food, maintaining mobile shelters such as teepees and modes of transportation like canoes that enabled them to travel efficiently and cover great distances. They often made seasonal journeys following herds or animal sources of food, fishing and hunting in warmer months and moving south in the winter. Permanent settlements came later. They recognized that the land could not support them at all times, and that it had to go through periods of fallowness to replenish its abundance. Make decisions as a community, not individual rulers. The American Indians were often structured as communal decision making bodies, making choices in dialogue and consensus building rather than at the bidding of a central ruler. Hence, their choices tended to consider longterm consequences rather than the narrow interests of a select few. How do we integrate these ideas into our world today? Can we shift our thinking and our actions to reintroduce these ideas into our world, and find ways to live in greater harmony with nature, and with ourselves? What will have to change? Or is it too late, and have we come too far down the path of resource depletion and man-made climate change to reverse what we’ve done? Are we headed down the path of extinction? The stakes have never been higher for human beings, and for all life on earth. Perhaps by learning about the peoples of the past, observing how they created sustainable communities that survived for tens of thousands of years, we can take some lessons that may help us point the way to a more harmonious future. 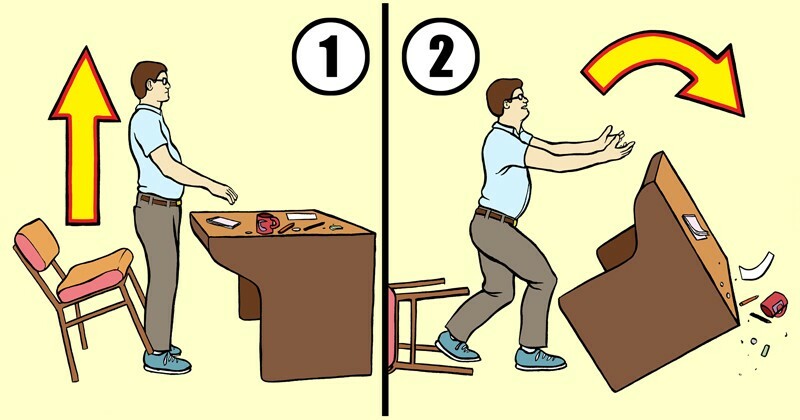 What to Do When Projects Die. Sixteen (and a half) ways to work through post-project grief. Image from “Business Reply” by Packard Jennings. It’s probably happened to you. Sometimes, a project just… goes away. It could be for any number of reasons: The funding dries up. Strategic priorities shift after a merger takes place, or a new department leader is hired. Sales didn’t hit their goals for the quarter. Creative differences between the Widget division and the director of Wicket resources couldn’t be resolved. The boss woke up on the wrong side of the bed that morning. The creative was off-target. The target was off target. There was no target! The strategy was flawed. The strategy was perfect, but the execution was… On, and on, and on. The truth is, there are an infinite number of possibilities as to why a creative project doesn’t get off the ground. Regardless of the cause however, the outcome is more or less the same: no project. So, what do you do? Cry. Cry, a lot. Seriously though, what do you do when a project that you care about (presumably that you’ve invested time in, and furthermore that probably represents revenue for you or your business), does not come to fruition? Besides working your way through the seven stages of grief, here are a few thoughts, gathered from creative people, the internet, and from a lifetime of mistakes, hard-earned wins, and experience. Enjoy. Politics will Always come into Play. No matter who you’re dealing with at whatever level of the organization, they will almost certainly be beset by institutional politics, and as a result, you will too (and if you’re an outside vendor, independent contractor, consultant, or just have a job pretty much anywhere, you’re probably dealing with politics on your end as well). And, to make matters worse (or, more of a ‘challenge’ to put a positive spin on it), in times of volatility, the tenor of institutional politics will almost certainly be bad, not good. Power Matters. Though I did not mean for this post to become a treatise on dealing with institutions, there are a few points here that bear consideration. When dealing with institutions, the POWER of your constituents matters a great deal. And, beyond relative power and influence of the people you’re dealing with, the number of those people who are bought-in also matters. It’s often not enough to have one powerful person bought-in to a project; in an organization of any significant size, you will almost certainly need buy-in from constituents at multiple levels of the institution, which means at least two or more powerful people climbing on board to champion the project. Eventually, it’s also almost certain that you will need support from a majority of the constituents concerned to get an approval. And again, in times of volatility — not an easy task for anyone. But a good rule of thumb is to get as many people of power IN THE CHAIN OF COMMAND on your side as possible. Toe-stepping, or nose-shape-bending can be the death-knell of many an otherwise-worthy project. Be warned. A lesson from the book of Job can be instructive here — sometimes, things don’t work out, not because you’ve done things wrong, but even when you’re doing them right. Still, you have to keep the faith, and keep going. You can’t give up. Ok, Sometimes, it actually is You. But it’s still not “You.” Ok, remember how before I said it wasn’t you, but then I said well, maybe it was, but that we’d get to that? Well, here we are getting to that. So, sometimes, when things go down— due to politics, or volatility, or whatever— “you” can absolutely be a factor in the thing not happening. “But, how?” You may ask? Well here’s how. And I’ll try to put this in a positive way so nobody feels bad. Ask more Questions. Sometimes when a project doesn’t happen, we may not have asked enough questions, or the right questions, in the right way. And we may have done that because we didn’t know which questions to ask. That’s ok! Rule of thumb — better to ask more questions and be bold in those questions, than not to ask enough questions. We may uncover some of the features of the situation that we didn’t perceive at first, and reveal details that could force us to revise our thinking on the project as a whole. Ask, ask, ask. Listen (A LOT). If we’re gonna ask questions, we gotta learn to listen to the answers — no, I mean REALLY listen to the answers. Listen carefully to every word that a client or potential client says, and pay careful attention to the words they DON’T use. Often, if you listen carefully enough, your client may be telling you that this project is DOA even if it sounds like it’s not. There’s a lot of “fronting” in business. Don’t be fooled. Research (the Crap out of Everything). Yeah, it’s boring and time consuming. But getting as much information as you possibly can about what you’re being asked to do and who you’re dealing with can only help you. You can never do enough research, and while it can be a time-consuming rabbit hole to get sucked down, do as much of it as you can stomach — and you may find answers to some of the questions that you have, including the reasons why a project may or may not happen. Trust your Gut. If you get off the phone with a client, and you’re left with the impression that in order for this project to work, you’ll need to find a two-headed man, a submarine and a flying unicorn, that should probably tip you off that something’s not right. Basically, if you get the vibe that the project doesn’t make sense, or you’re missing a really big important piece of information (like buy-in from a major constituent), don’t ignore that feeling. That’s a real red-flag that you should pay attention to. Put it this way — once red-flags go up, projects don’t usually improve further down the line. Don’t Keep All Your Eggs in One Basket. Ok, this is an easy point to make, but still a hard one to live by. Don’t give any one thing — any one person, job, client, project, industry or anything — too much relative power in your life. Gotta keep things in balance. Like most financial planners are fond of saying “Diversify!” The more you can spread the ‘risk’ quotient of your life around, the less of a hit you’ll take emotionally, spiritually, and financially, when one of those projects doesn’t go through. It’s hard to live by because nobody’s perfect, and sometimes we have to take risks — like depending on our one job, or that one project. But if we can structure our lives to keep moving forward regardless of any one person’s choice (or even a bunch of people’s choices), than we’ll be that much better off over the long run. Protect Yourself. We may not always have this luxury, but it is wise when beginning an engagement with a client to put some sort of agreement in place, and if you can, include in the contract an element or clause that guarantees you some form of up-front payment for time spent. Sometimes projects “die” before a contract is signed (hello there, “pitch” process — I’m looking at YOU! ), and bam, you’ve just been initiated into the world of “free consulting.” But sometimes they die after everything has been inked, which gives you at least an opportunity to soften the blow by negotiating compensation for the time you do spend working. Any time you can make that happen, do it. Talk About It (Get Support). And when we do hit obstacles we may have the impulse to bury those feelings or hide our disappointment. We may feel ashamed, or feel like failures. It’s natural to feel those feelings. That’s the very human part of us, physicalizing our emotional and psychological experiences. But we don’t have to keep it all to ourselves. Mourning is a part of being human, and it’s okay to mourn creative work when it doesn’t happen. 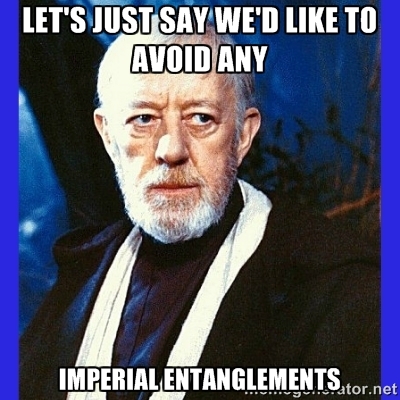 It may even be necessary for us to move on. Every human being has experienced disappointment (and for the one person out there who hasn’t — you will). It’s one of the things that makes us human. Sharing our burdens with others lightens the load for all of us. And you may be surprised what you hear in return. Turn it into Art. Not to put too fine a point on it here at the end of a blog post about projects dying, but certainly one lesson to draw is to convert the energy of disappointment into something creative, whether that’s a piece of writing, an art project, music, code, or whatever, and share it (or not). Again, rather than let a frustrating experience drag us down, redirect that energy into something that fuels you. Not only will you feel better, but you’ll come away with a new perspective, a new angle on the experience, and you may have something concrete to point to that externalizes the energy you’ve absorbed, and perhaps — icing on the cake here — helps someone else down the road. Matt Landfield is the co-founder of TimeTravlr Creative, a creative consultancy and production studio in Brooklyn, NY. 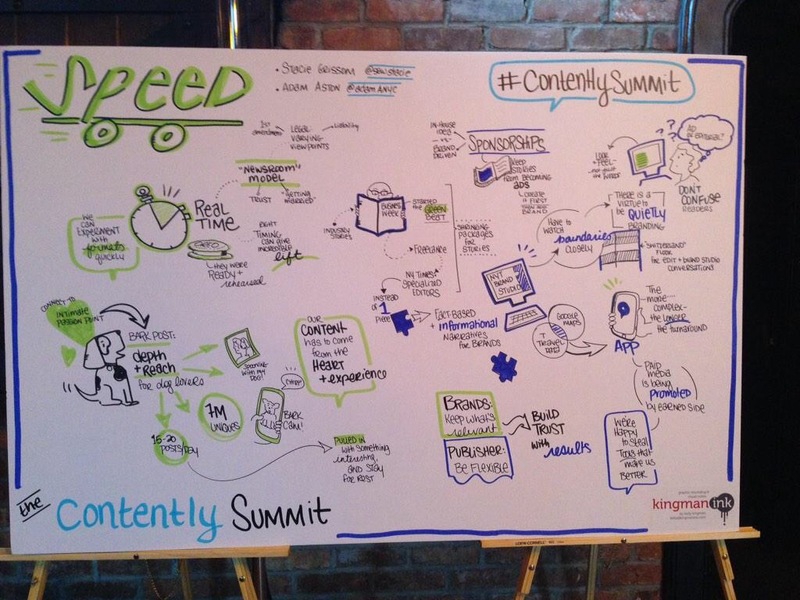 What follows is a thoroughly subjective, thoroughly incomplete report of my own recollections and notes from the Contently Summit held at the Bowery Hotel on November 6th, 2014. This report is in no way meant to represent a full accounting of the event, and rather provides my own impressions and takeaways from some of the panels, speakers and discussions. Having recently returned to freelance life after leaving a job at a media company in New York, I reached out to friends in my network letting them know about my change of status. One of those friends hit me back with a note suggesting that I come to a networking event he was attending the following week– the Contently Summit, being held at the Bowery Hotel– and he followed that up with a ticket. Fast forward a week and change, and I found myself stepping into the cavernous terrace area of the Bowery Hotel on a cold rainy morning in early November. Greeted warmly by a team of young tech industry types wearing bright blue T-shirts under their blazers, with the word Contently emblazoned in white across the front, I wove my way past the catering tables and coffee urns, and the hurried organizers stacking up schwag bags and give-away T-shirts in preparation for the blitz to come. I settled in to a seat on a plush sofa while brand marketers and journalist-types filtered in, nibbling on scones and pastries and sipping coffee. Suppressing a familiar sense of panic at being surrounded by strangers at a social event, I managed to fall into a light conversation with a marketer or two and a journalist making requisite Ebola jokes to break the ice. Shortly we were ushered into the main hall, where rows of high backed chairs were set in a backwards L shape, projecting at right angles from a small stage in one corner of the large room. After a brief introduction by Joe Coleman, co-founder and CEO of Contently, journalist, “Digital Media Consultant” and content-marketing guru Neil Chase took the stage as moderator, and kicked off what would turn out to be a long but astonishingly rich day of conversation between and among a parade of heavy-hitters in brand and content marketing and digital publishing. Right off the bat, in the first panel on the subject of Audience, Steve Rubel, EVP and Chief Content Strategist from Edelman, described the “secret sauce” of successful content marketing as “the front-loading of the thinking” around distribution, and finding the tricky balance between applying distribution tactics without impeding creative. Rubel described the outcome of an Edelman/IAB study focused on understanding audience response to sponsored content and native advertising, which found that 60% of responders were open to advertising that tells a story, rather than ads that “sold” a product. Audrey Gray, AVP and lead communication strategist at MetLife, talked about successful efforts she had undertaken at MetLife with the MetLife To Go portal and the MetLife Corporate Social Responsibility pages, and that some key takeaways for her were using a mix of high and low budget media, along with deployment of user generated content. While Gray commented that she makes use of both video and photography in MetLife’s content marketing efforts, she was very enthusiastic about the ability of photos to tell a story in a compelling and accessible way and emphasized the importance of good photography. Both Gray and Rubel agreed that video when deployed correctly provided significant value, but Rubel made a keen observation that “there’s a stigma on watching video in the workplace,” where photos don’t have that problem. Rubel was also sanguine on some older but perhaps overlooked communication tools like email and audio podcasts that continue to stay relevant despite their lack of “gee-whiz” dazzle. Joe Lazauskas, representing Contently on the panel (as Contently’s Editor-in-Chief), in a discussion of the Contently platform’s focus on engagement metrics, emphasized the values of relevance and authenticity noting that some of the most popular articles on Contently’s own channels were on the subject of “content measurement.” Further in the discussion of tracking engagement metrics, Lazauskas noted big jumps in engagement in stories that were very human, and that while many brands struggled to find a “human” editorial voice, establishing that voice was extremely important. 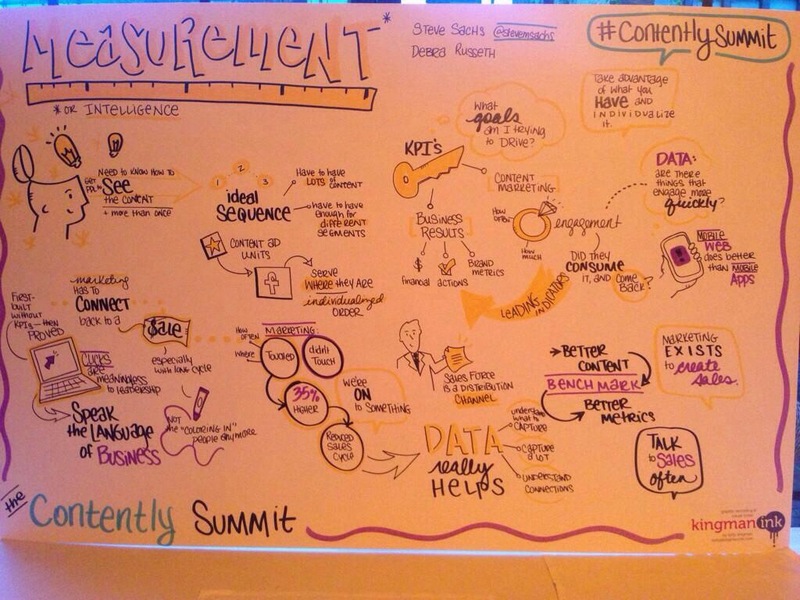 An awesome live infographic drawn by Kelly Kingman at the Contently Summit. A lot more was said by Steve Rubel, Audrey Gray and Joe Lazauskas, some of which is captured in the live infographic included above, but the insights described above were the primary bits that I captured in my notes. 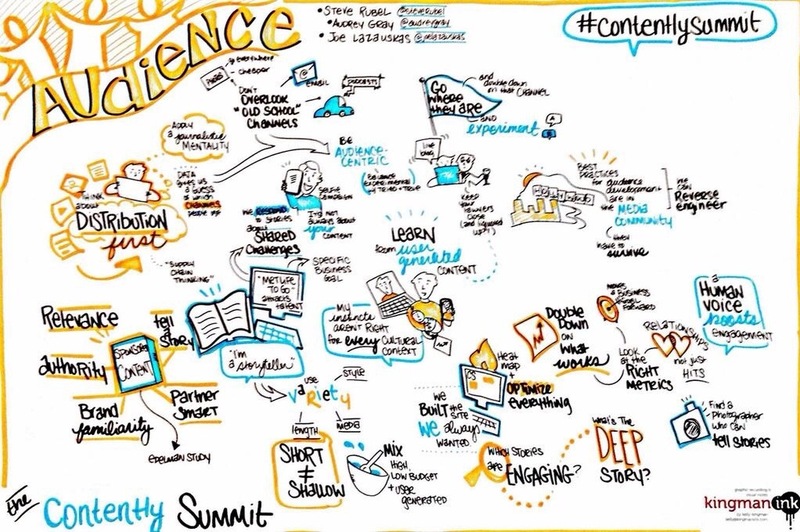 No, not this blog, or even the Contently Summit, but rather Contently itself– the next speaker was Jay Moye, Editor-in-Chief of Coca-Cola Journey, Coke’s online content hub powered by Contently. Moye spoke at length about the tactics and approach employed by the team at Coke Journey, which included a broad mix of story-generating and optimization efforts, many of which were powered by Contently. Moye covered a lot of ground, but one of the most salient points that he touched on was the importance of unbranded storytelling in conjunction with branded messages. Moye and his team are pursuing a strategy of reeling people in with unbranded content, with the hope that users will be drawn in and stay, increasing their likely exposure to branded messages– an approach that is proving itself out with low bounce rates and high engagement time on the Coke Journey hub. He even had a unique unit of measurement for the success of their content efforts, called EOI– Engagement on Investment, which was composed of data gathered from social channels, site page visits, and search data. The Journey team’s 2015 strategy includes a focus on Multimedia, Real-time marketing, and International Expansion– including cross-pollination of efforts from markets inside and outside the US (citing as a prime example the success of the “share a coke” campaign, which is running in 50 countries). Data Trumps Politics– in a big organization like Coca-Cola, decision-making can be very political, but using data to prove success can make those decision a lot smoother and clearer. Of the brand representatives who spoke at the conference or were in attendance, it seemed that Moye and his team at Journey were publishing content at a fairly high rate, generating 12-15 pieces a week, and using a mix of paid, owned and earned channels to amplify the content they do produce to make sure it’s not falling on deaf ears, using Outbrain, social & paid social. Another interesting point that Moye touched on briefly was the place and role within the corporate organization that Coca-Cola Journey occupied, namely that the content hub fell under the Corporate Communications division of the company, and operated independently of the marketing division. After a heady and pithy morning of discussion, I was also grateful to take a break for lunch at this point, as the high-backed chairs had slowly taken their toll on my tailbone. Lunch was provided, and the atmosphere at the hotel was lively and enthusiastic. The morning panel and conversations clearly resonated with the audience, and the lunchtime discussion was casual but equally engaging. And, when it was time to return for the afternoon session, new arrivals crowded into the auditorium, making the second session even more well attended than the first. The afternoon started off with a bang with Chad Mumm from Vox Media, Wilson Cleveland from Unboxd, and Andrew Greenwood from GenPac, up to talk ostensibly about Quality in the content equation. Wilson Cleveland led off with a run down of several projects created by Unboxd, a digital studio that creates original, story-driven, entertainment programming for brands. Unboxd got started creating a show called The Temp Life, a narrative, character-driven comedy series created for Spherion, a large temp agency that wanted to reach a new audience using online video. The Temp Life ran for five seasons and was a huge hit on YouTube and myDamnChannel, and led Cleveland to produce a number of other series for corporate clients, including a show about tech startups called Leap Year, created on behalf of Hiscox Insurance Company. When he was approached by the client, they were interested in offering their insurance product to a new market– tech startup founders– but lacked insight into how to gain the trust of that audience. Wilson’s response was to start with a strategic approach to creative to “prove to [the target audience] you understand them,” and pursued an “unbranded” approach to storytelling– there was no product placement in the series (through specific directive of the client), and instead he shot “tangentially” related stories, storylines that were connected to the brand, but no direct product or brand placement. And that approach yielded results. According to Cleveland, “Leap Year was responsible for a 35% increase in insurance quotes over the 12 weeks the show ran.” Leap Year was renewed for a second season, and is in talks to make a move to television. Next up was Chad Mumm the head creative at Vox Media and Vox Creative, the branded content arm of Vox. Chad came out swinging with a discussion of some Vox’s branded content efforts, including First & Long, a branded series created for Nike, where six NFL stars returned to their high-school stomping grounds unnanounced, and out-toughed their entire hometown teams through grueling practice sessions and impromptu games. The series was booked, executed, completed and delivered in two weeks, despite the fact that some of the NFL stars didn’t have existing deals with Nike. Vox leveraged the power of their existing fan and NFL star relationships through SB Nation, Vox’s network of sports media properties, and swung the deal in record time to capitalize on audience interest in pre-season high-school football. Mumm also described work on The Next Mile, a sponsored content series created by VoxCreative for BP, where video, photography, and branded journalism are published on a hub and spoke model, with sponsored modules propagating throughout the web and on publishing and media properties owned by Vox and other partners. In the discussion of sponsored content, Mumm reiterated the emerging trend that in a media landscape that is becoming increasingly driven by social media engagement “The home page is dead, and now it’s all about the article page.” Mumm also discussed the Chorus and Harmony platforms, Vox’s proprietary software tools to enable and empower monetization of sponsored content. Andrew Greenwood from GenPac representing the perspective of the B2B marketer, emphasized the importance of establishing credibility especially in a B2B marketing equation. Among many insightful comments, he noted that an effective strategy he had observed for reaching C-level audiences made use of distributing 3rd-party research– information from a known and vetted source to establish credibility, and that credibility was extremely important in making an impact on high-level audiences. First, Define Your Theme— What is your story really about? Then, Set Up The Stakes— what are the stakes? SO IMPORTANT– the audience needs a reason to care. Give us a reason to care. For the audience. Develop the Arc— the arc of the story– who is the storyteller in the beginning, and who is the storyteller at the end? Every story has a beginning middle and end, but what is the change through the course of the story? Catherine Burns said lots more stuff, and then proceeded to do a Moth workshop with Contently Editor-in-Chief Joe Lazauskas and a personal story about his 9th grade crush, which was fascinating to see and a great story. That was a lot of stuff, but still more stuff happened. Two more incredibly smart people took the stage to talk about what they were doing– Steve Sachs, the CEO of OneSpot, and Debra Russeth, VP of commercial marketing and strategy from HSBC. Both Russeth and Sachs were focused on ways to measure the success of marketing efforts, and Russeth discussed at length the herculean efforts she and her team had gone through to build an effective measurement apparatus for their content marketing at HSBC, enabling them to prove out the value and return on the investment in marketing– no small feat by any stretch at any organization, though guided by the principle that “marketing has to connect back to a sale.” She also noted that they are seeing a lot of engagement on mobile, but that mobile web does better than engagement in mobile apps. Steve Sachs from OneSpot talked about the idea of “content sequencing,” or having an ideal sequence of relevant content for a particular audience, and an awareness of how that sequence is intended to produce effects, ie., the sale. From Sachs’ perspective, Content Engagement metrics drove business results, proved out in OneSpot’s findings, that the more pieces of content people engaged with, the more likely they were to deliver a business result. Sachs echoed Chad Mumm’s dictum from earlier in the day that engagement happened at the article level, but took it one step further, describing OneSpot’s approach of serving content to audiences on Publisher platforms, rather than expecting audiences to traffic back to a particular site (homepage) or publishing hub. Stepping in for Shane Snow, the co-founder of Contently who was traveling and unable to make it back in time for the conference, Joe Coleman the CEO/co-founder of Contently and Sam Slaughter, VP of Content, took the stage to wrap up things up. Coleman recognized the challenges that brands face in the content marketing landscape, acknowledging that “creating content that people like is really hard to do.” They also recognized the emerging shifts over the past several years and the emerging trends going into 2015, noting that many brands were moving toward “centralizing content,” and finding holistic ways to manage and produce content marketing. Building “owned channels” and using technology (like the Contently platform) to optimize and manage their publishing efforts were some of the ways that companies are finding to make reaching their audiences more cost effective and efficient, and both expected that trend to continue. “We’ve had more meetings with CMOs over the past 9 months than the past 3 years,” said Joe Coleman, as an indicator of the move toward building owned and brand-managed content hubs. And with that, Neil Chase wrapped up the day’s sessions, and prompted everyone to stick around for happy hour. Conversations continued at the bar long after the close of the panels, and by the tenor of the crowd it was clear that everyone had been left with lots to think and talk about. It was also clear from the caliber of speakers and those in attendance in the audience that the subject of the conference was important to a lot of brands, companies and marketers, as well as journalists and content creators, as the convergence of social media, mobile technology and the rise of the “connected society” were reshaping the media landscape for everybody. Hearing from those companies and individuals who are on the forefront of that change was valuable for all involved, and Contently deserves praise for providing the forum and for practicing what they preach– creating good storytelling that people want. I thanked my friend for the invitation, said my goodbyes, and headed out into the cold, rainy November evening, with lots of food for thought. So I’m about four weeks into my Kqool.com exercise experiment. After months of abortive attempts, the stars have aligned and I’ve gotten off to a good start. It’s been about four weeks, and I’ve managed to average about 3-4 days per week in the gym. What have I learned? Yes, bosu squats are hard. Jumping up and down onto a semi-spherical rubber balloon and balancing on it while doing deep knee-bends isn’t exactly my idea of kicking back, but then again, I’ve discovered muscles I didn’t know I had somewhere in the region of my thigh/outer leg/rear-end area. And they can get sore fast. But more than that, I’ve learned a lot in a few weeks. No surprise, I’m out of shape. And I’m not very flexible. My hamstrings are as tight as a drum. But my body has also adapted quickly, and I’ve definitely gotten stronger. Three or four weeks ago, I could barely do 12 push ups off the bench. Today, I did three sets of 15, at a good pace. My core is stronger, my back is stronger, and I feel different when I stand up from my seat on the subway, or find my balance on a moving train. There’s still a long way to go. Besides discovering the benefits of exercise, it’s also clear that not exercising can have a profound effect on your body, and your state of mind, in a less than ideal way. This process has helped to make that clear, and given me a chance to observe the opposite effect, going from a state of zero as it were, to one bosu-step forward. Getting back to exercise again after a long, long hiatus. My company (Magnet Media) recently signed us up for a corporate gym membership, so I joined. My knee injury has healed with the help of physical therapy, and also a better configured bike seat (it was too low before), and I’m feeling a strong need to get back into physical activity. I don’t have a huge budget for this process, and the gym membership itself isn’t cheap. So I’m trying something new. I made a video a few years back for a client who created a website for personal training called kqool.com. He used the website to transmit workouts to clients remotely, so that they could follow his routines on their own– and stay up to date with their training on days when he wasn’t able to work out with them (when they were traveling, or simply on the off-days when they didn’t train with him). I’m going to use kqool.com to get myself into shape. My plan is to go to the gym four mornings a week– Monday, Tuesday, and Thursday, Friday. I’ve made it there three days so far this week. I’m doing my best to follow the routines (I’m really out of shape, and they are hard), but also to go easy on myself as I’m just getting back into exercising after a long break. The gym has a pool, and I’ve also been taking some of the time to practice my swimming. I only learned to swim properly as an adult, and I’m also out of practice there, so I’m using my time in the gym to brush up on my swimming skills, as well as follow the kqool routines. I’ll post regularly with my progress. lovely wife, a nice home, and all the comforts and conveniences of modern living. One thing I also have is an injury to my right knee, which, over the course of several months, has gradually deepened and worsened, so that I can’t ignore it anymore. It’s not enough pain to make you cry out, but just enough to remind you of how uncomfortable you are when sitting down, no matter how accommodating the chair. Even standing still or climbing stairs is irritating sometimes. So today was my first day of physical therapy. Though I’m only 36, I felt like an 80 year-old man trying to stretch my aching right leg out straight for the therapist, to show her how far my hamstrings could go. This condition is unacceptable to me, and it is long past time that I did something about this, and I’m ruthless in my self-castigation—how could I let myself get to this point? Yet I’m not at all surprised that this battle has to be fought yet again, this struggle against inertia, which proves over and over again to be one of the most powerful forces in our lives. No amount of resolve is ever enough to overcome it, inertia can only be overcome by an intensive influx of energy, and even then, it will always win in the end. The challenge is to struggle against inertia, and in doing so, live— not try to overpower it.